AN Restorations are passionate about classic sports & muscle cars and the Mercedes Benz marque is no exception. After the Second World War, Mercedes Benz placed a large emphasis in re-establishing its sporting image. 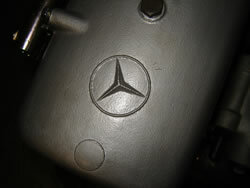 Mercedes racing cars took part in Grand Prix, sports car and road race events and were often successful. 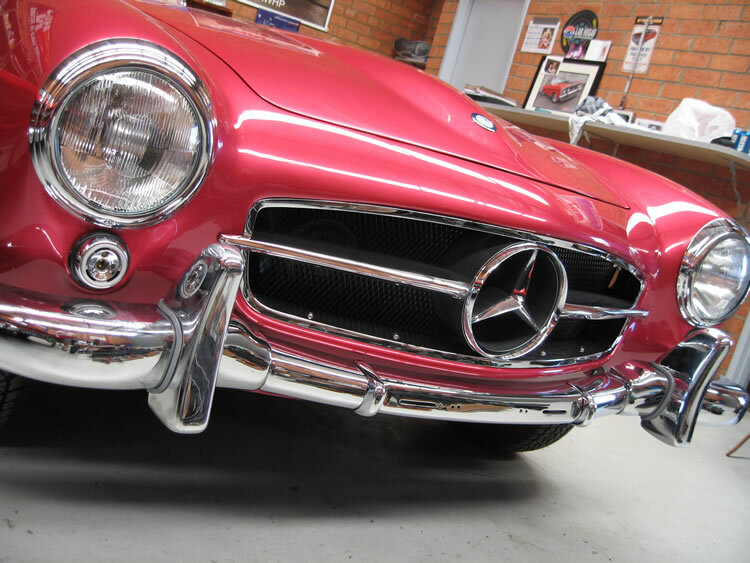 The 190 SL wasn't designed to be a true sports car, but the company still wanted to offer customers the option to race their 190SL in competition. 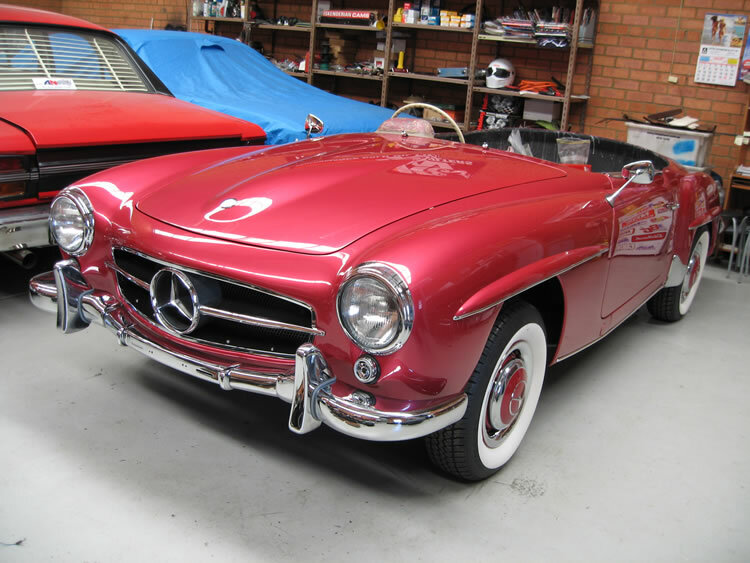 The 190SL was officially introduced at the 1954 New York Motor Show as a prototype along with the 300SL (Gullwing). Mercedes recognised a need for a lower priced sports car as an alternative to the expensive 300SL. 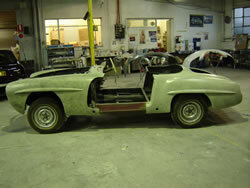 One year later the first production version of the 190SL appeared at the Geneva Motor Show in 1955. 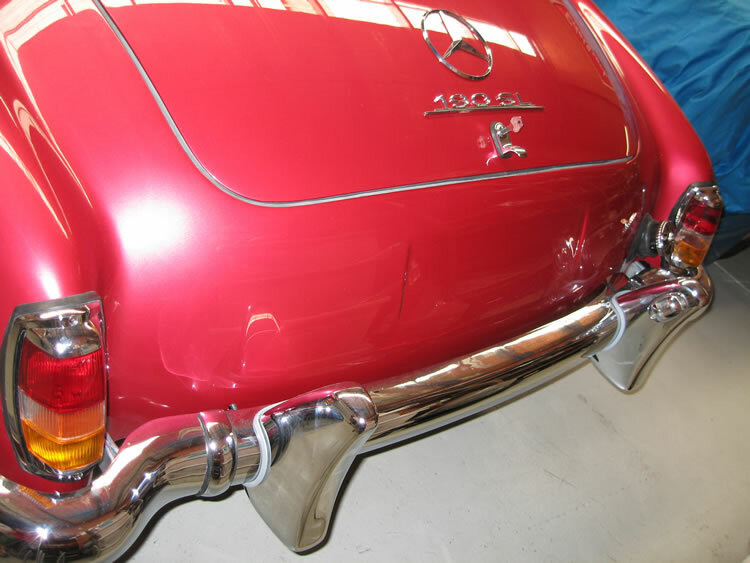 In the Mercedes nomenclature, the SL means Sports Light, however the 190SL is quite heavy, but it is still able to maintain attractive and sporty lines. It is easy to drive and it is an excellent and reliable touring car with acceptable performance by modern standards. 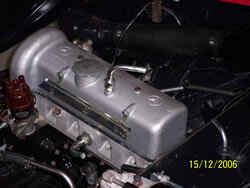 The engine is a four cylinder 1897cc with 105 HP. 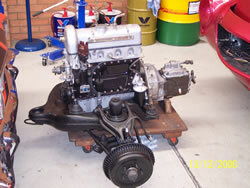 Our customer’s engine is ceased and will undergo a complete overhaul and rebuild along with the entire transmission. 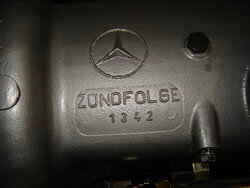 Many reliable components from other Mercedes series were used in the 190SL which were produced from 1955 to 1963 and in total 25,881 were manufactured. 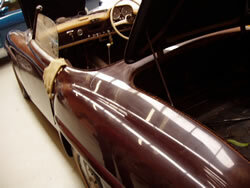 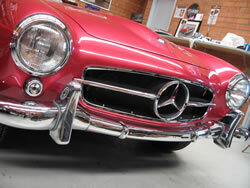 The 190SL is an attractive collector’s car with a beautiful classic body, and it is fairly inexpensive to maintain. 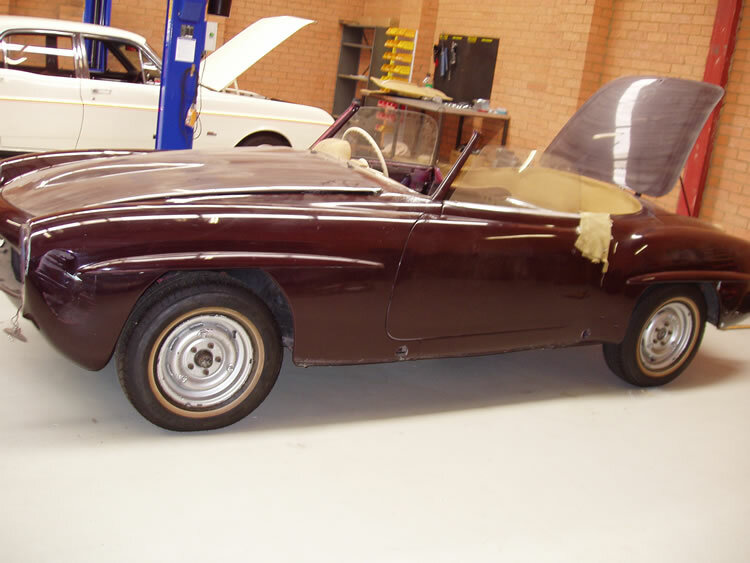 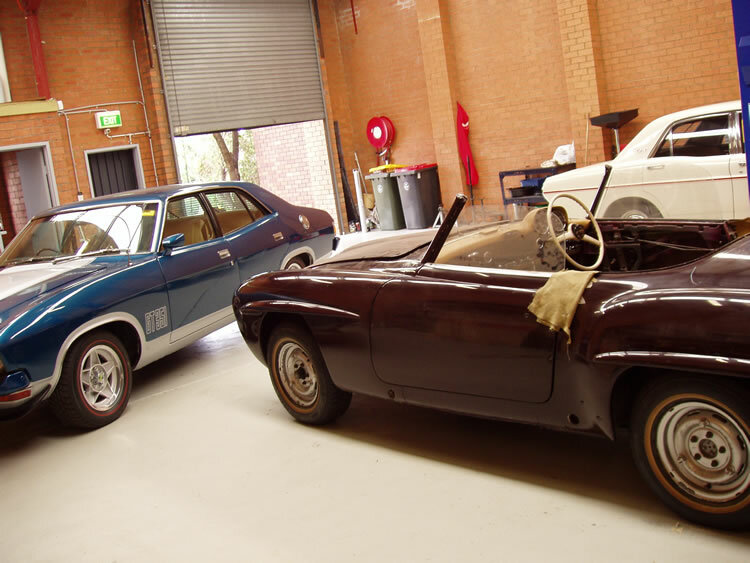 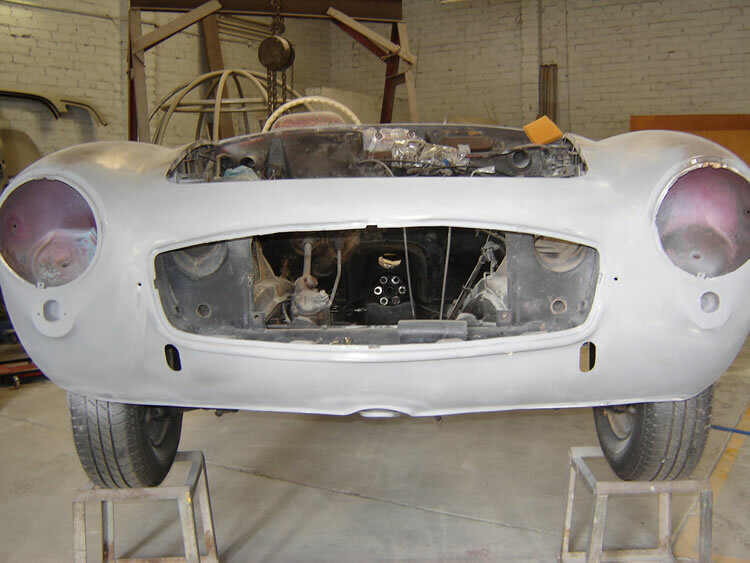 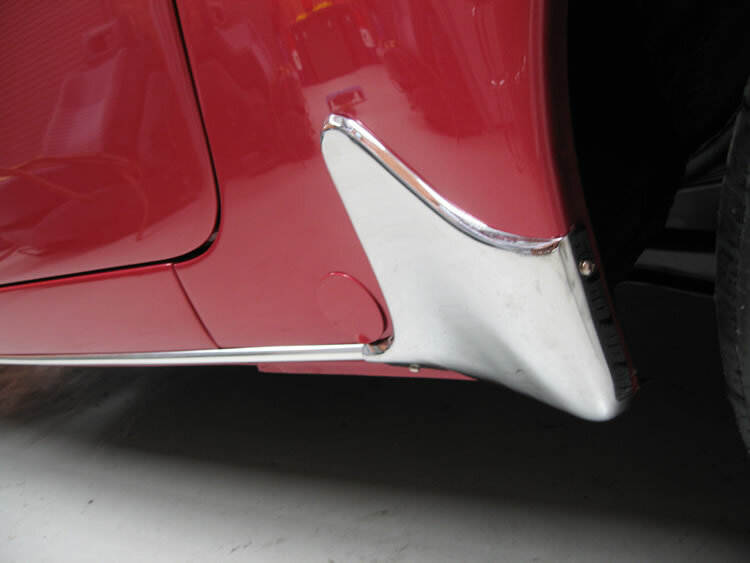 Although we offer concourse restorations, our client wishes to use this car regularly and we will restore it to a factory appearance with completely new paintwork and custom trim. The remainder of the vehicle will be completely refurbished, so stay tuned for our updates. 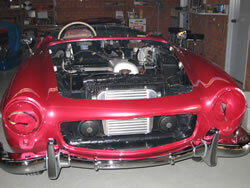 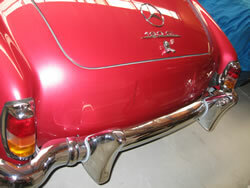 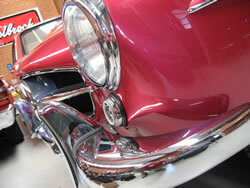 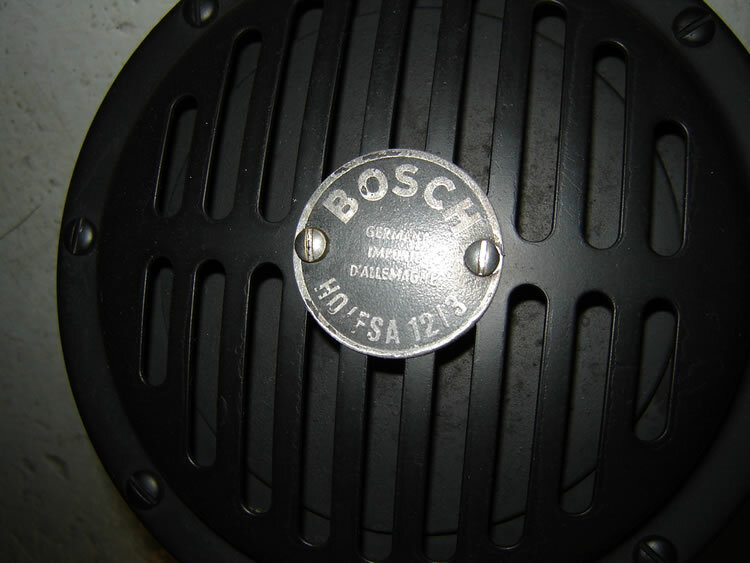 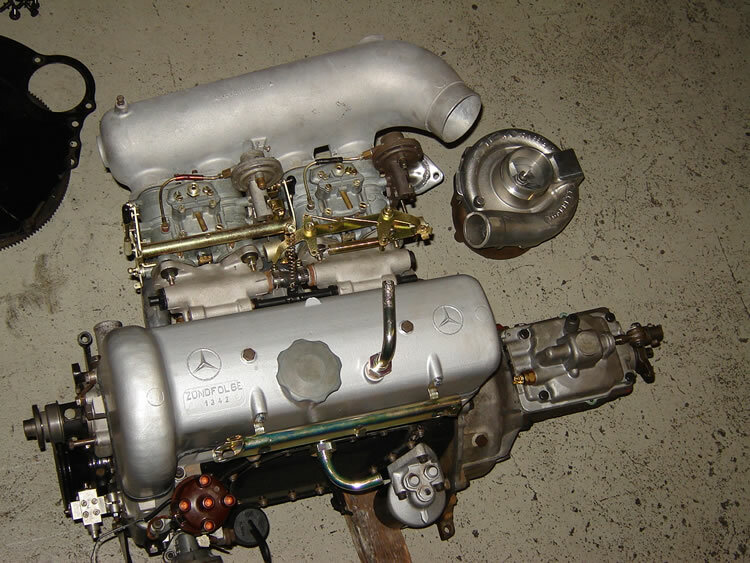 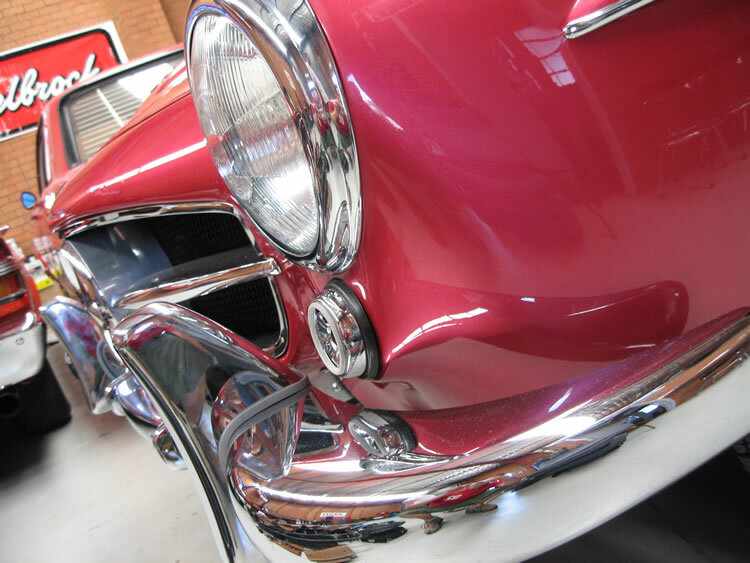 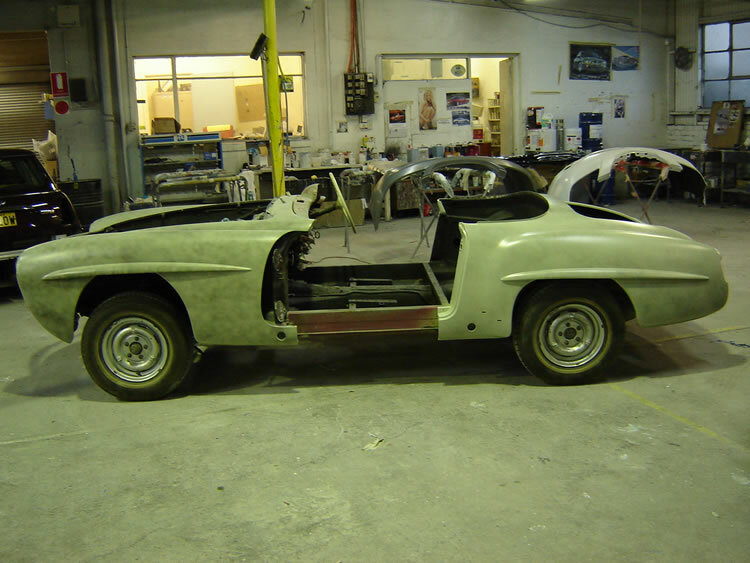 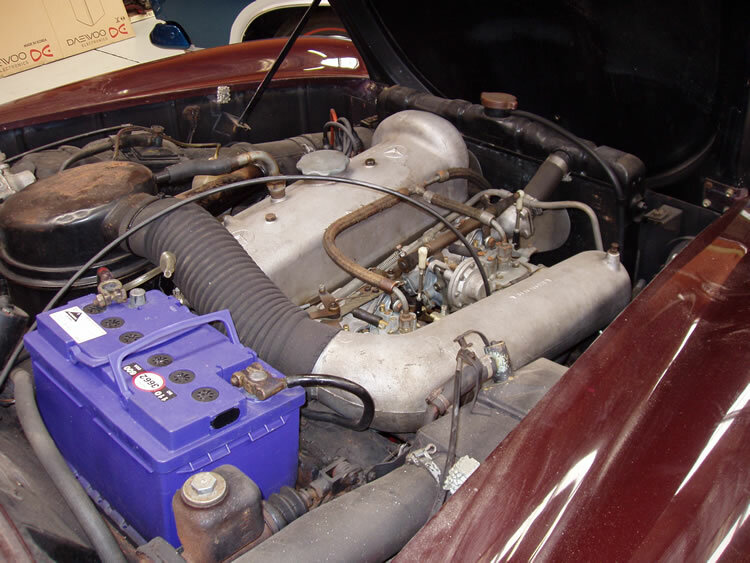 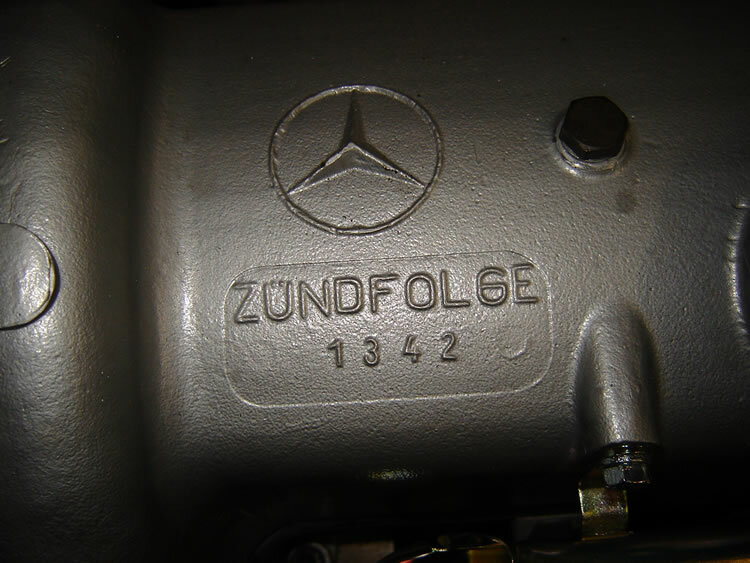 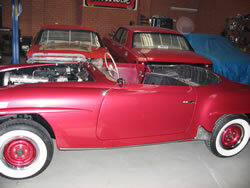 If you own a classic Mercedes Benz, or any period sports car, talk to us about your next rebuild. We’re only too happy to provide a quote. 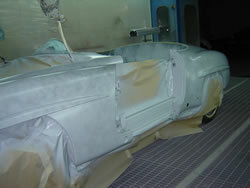 The paint on the Merc has now been completely stripped bare with paint stripper "the old school way". 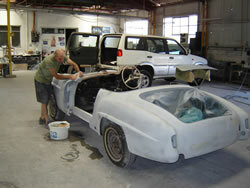 Now Adam starts to work the file over the body. 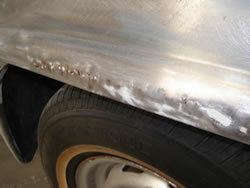 We found heaps of bad repairs all over the vehicle and we found the front was the worst part. 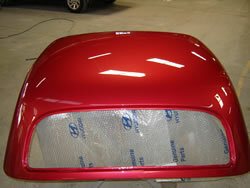 Adam had to rework the grill opening and headlight buckets. The lower apron was completely out of shape. The front end is now repaired. 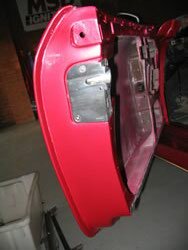 Now the doors and quarters will be repaired. 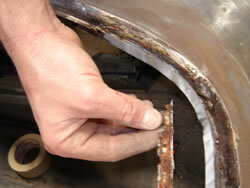 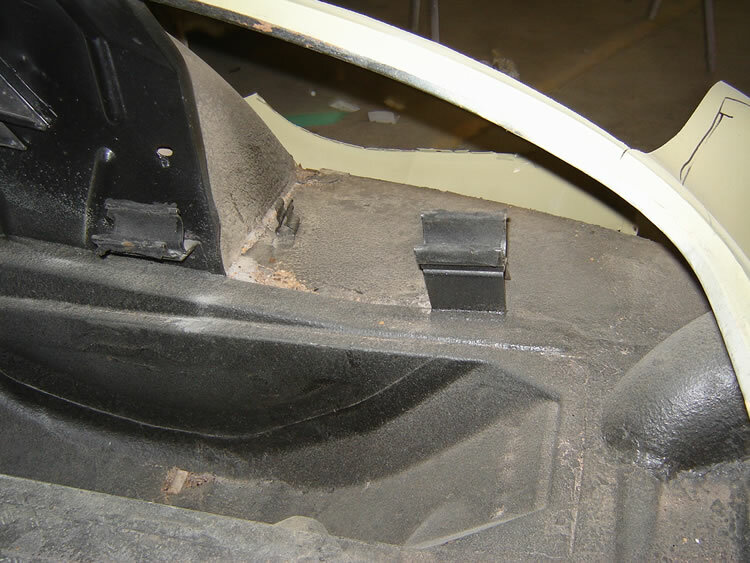 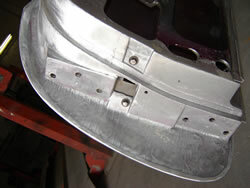 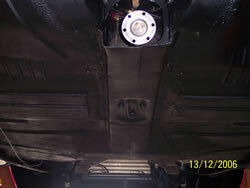 The boot surround will require fabrication of new sections. Adam gets to work by welding new sections in the boot channel. 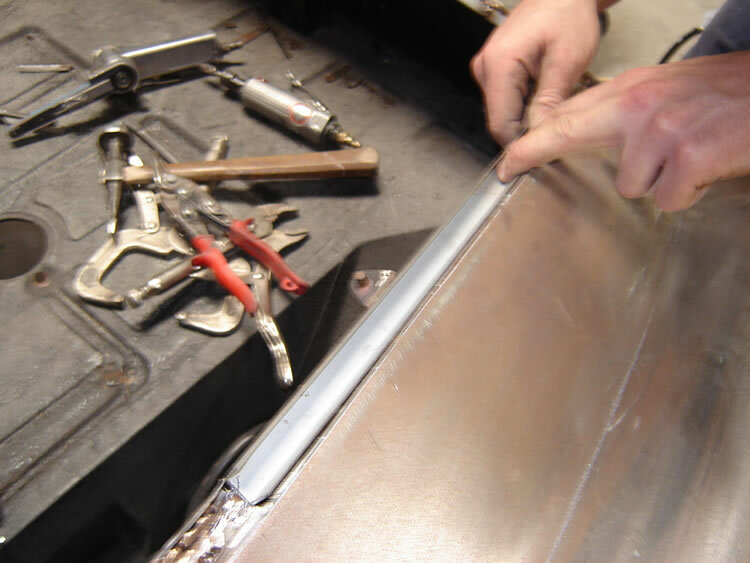 A state of the art brass welder from FAN is used for this job. 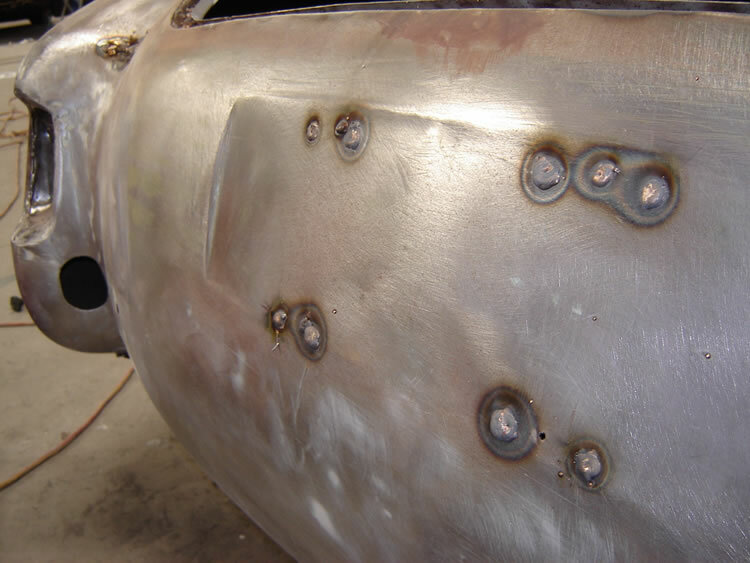 The advantages with this welder is low heat and excellent penetration. All hanging panels have now been expoxy primed and await the speed file. 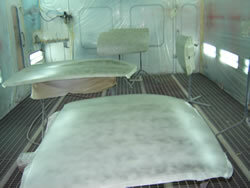 Next stop will be the body prime. 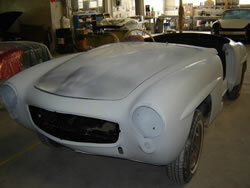 Since the last update, we have been very busy massaging the little roadster back into shape. 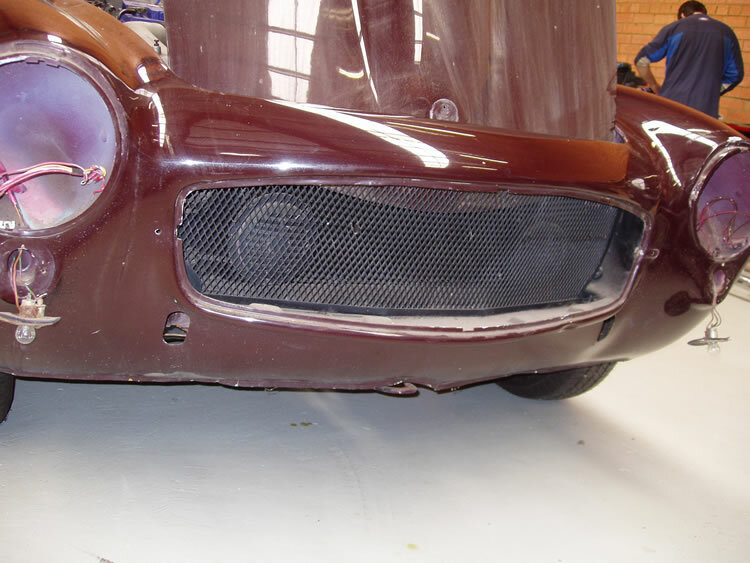 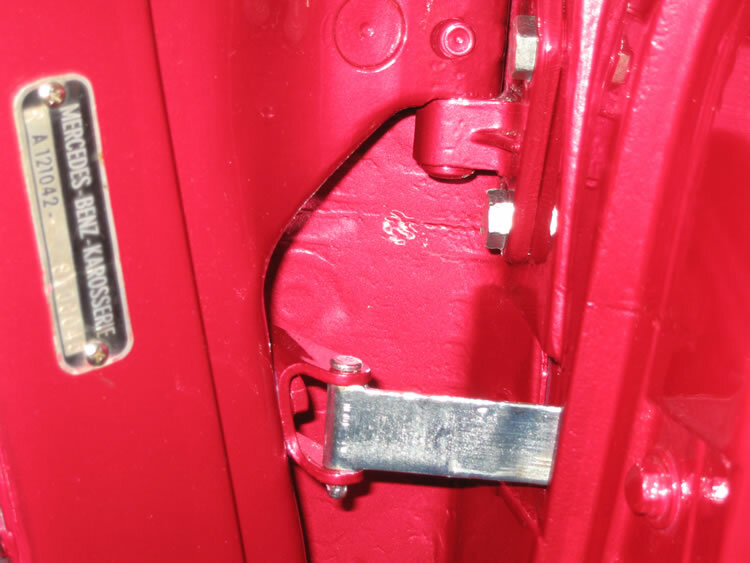 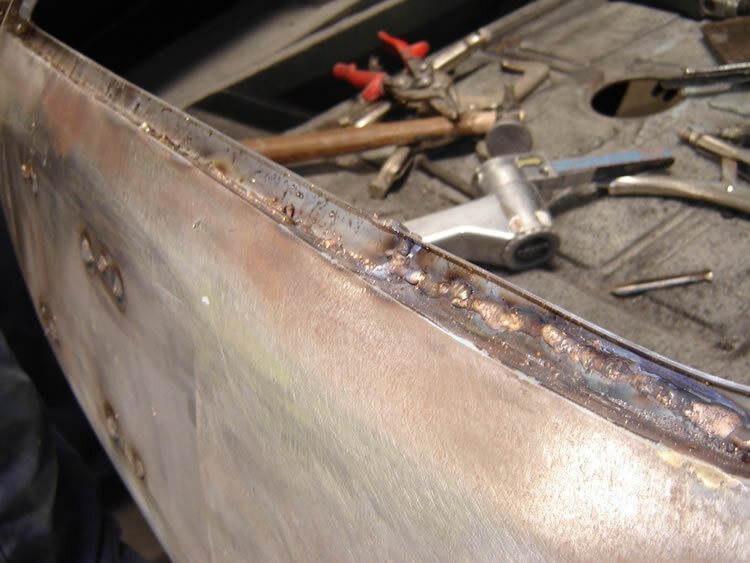 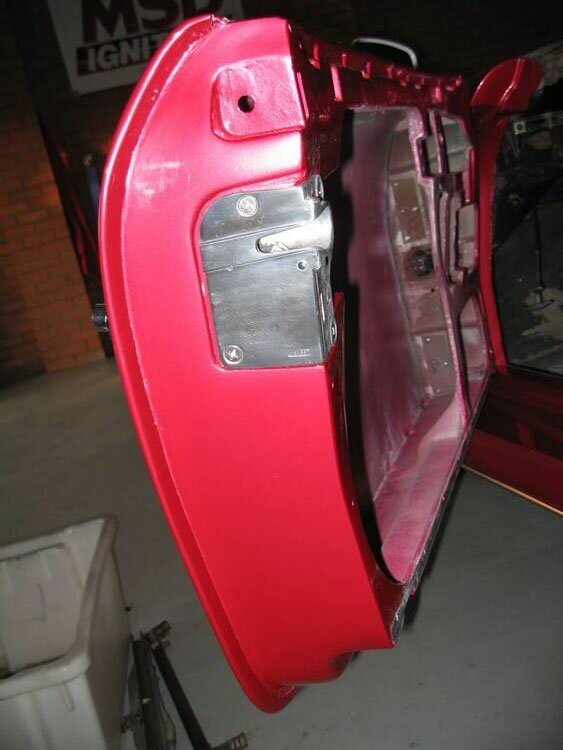 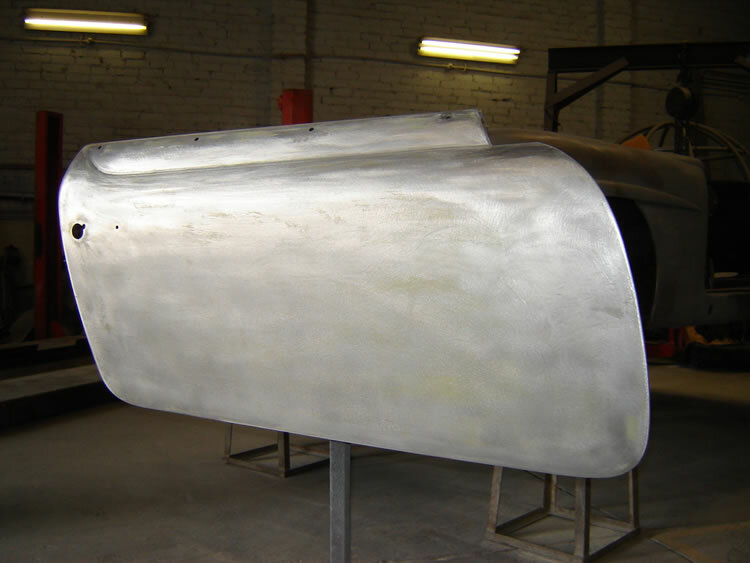 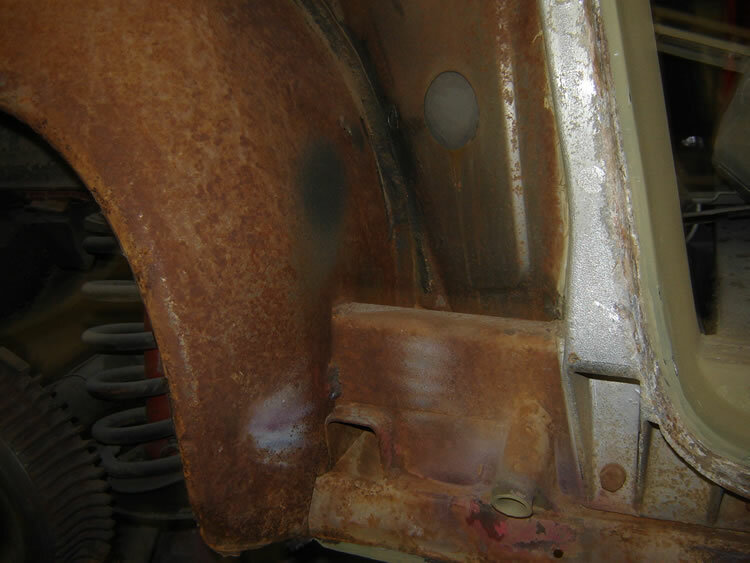 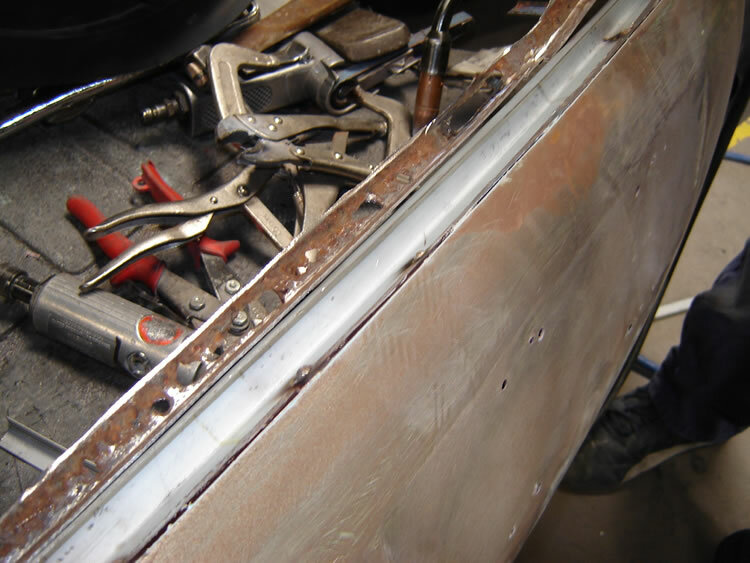 What turned out to be a very miniscule amount of pinholes on the rear quarters, turned out to be a total removal of the panels themselves and sourcing genuine panels that Adam stitched into place eliminating all possibilities of rust rearing its ugly head once more. 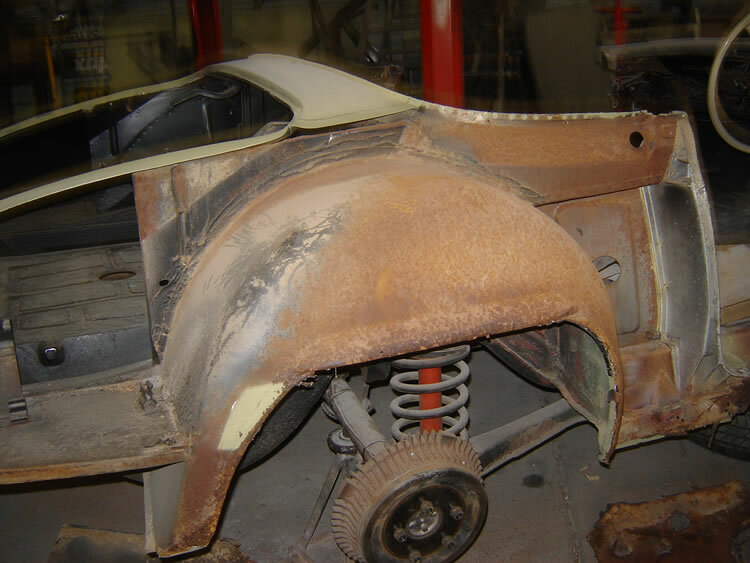 This coupe has been a challenge doing, as no short cuts were taken anywhere and POR-15 has been applied liberally in all hidden rust prone areas. 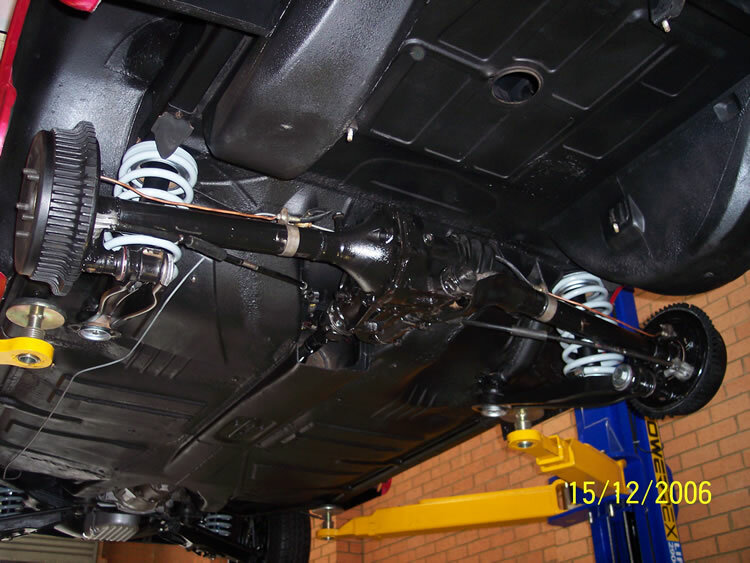 Whilst this was all taking place, some other important issues needed addressing such as engine transmission, suspension parts, all usual bright work and sealing rubbers bushes and all bolt on accessories plus all the leather interior pieces and nick-nacks. 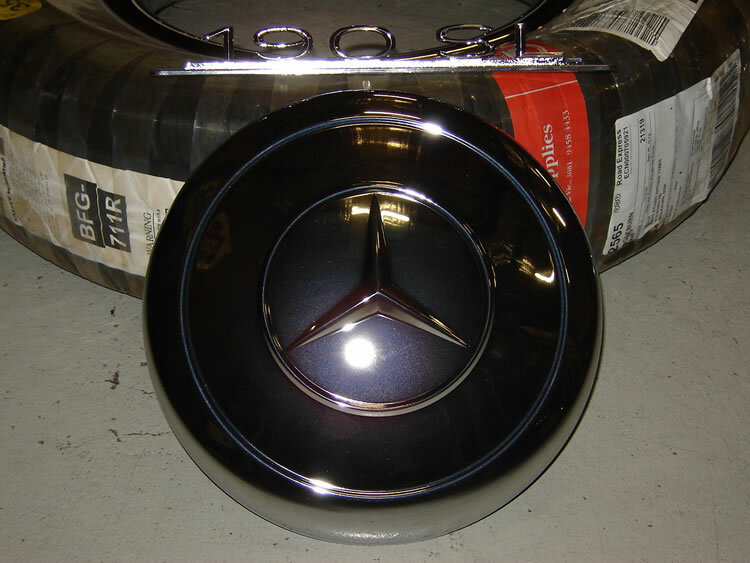 We believe along with the customer, that this stylish and classy vehicle deserves more than the Mercedes fitted 105bhp engine. 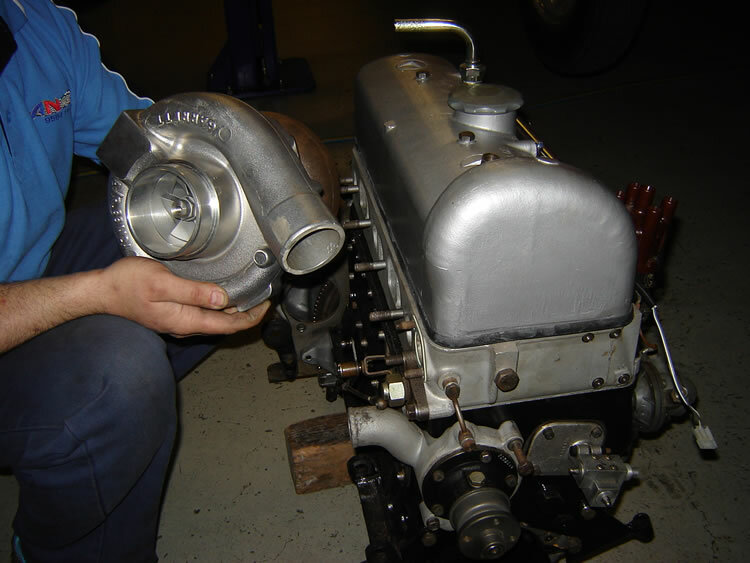 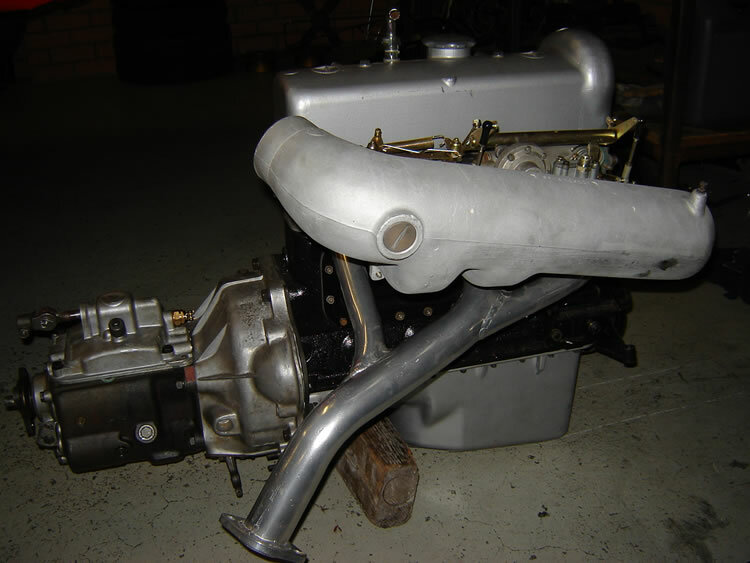 A 1.9 litre fully rebuilt spec motor plus a bolt on turbo charger along with custom made intake manifold and complementing exhaust manifold will turn the original sedate setup to a true sports package by doubling the factory power figures. 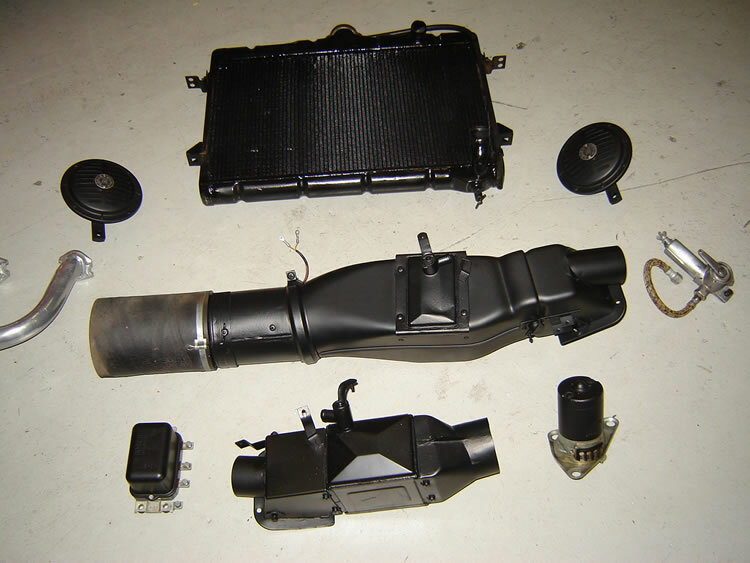 A late model EFI set-up will be fitted as well. 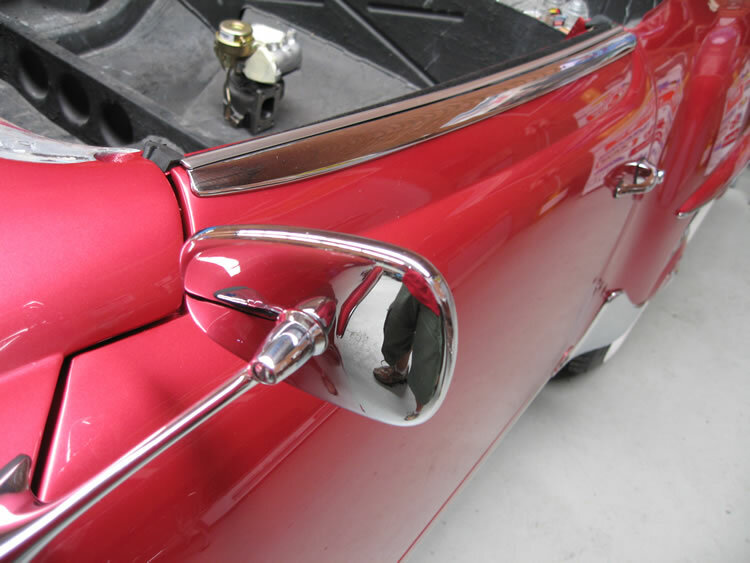 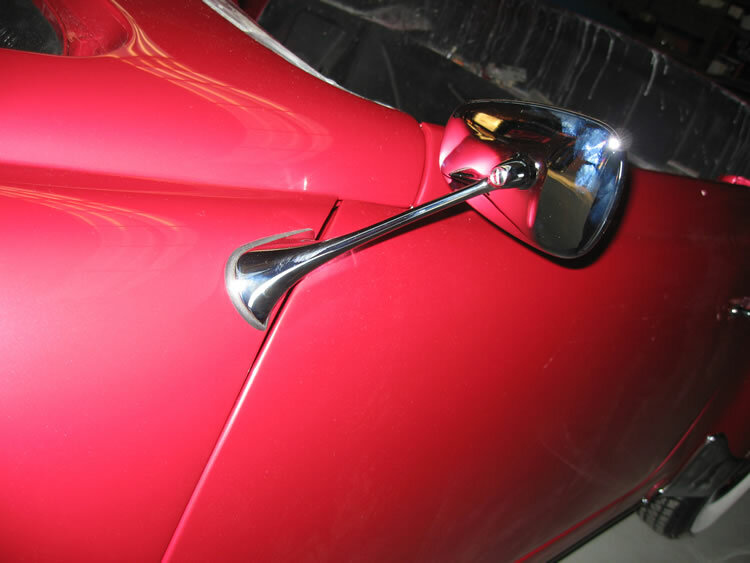 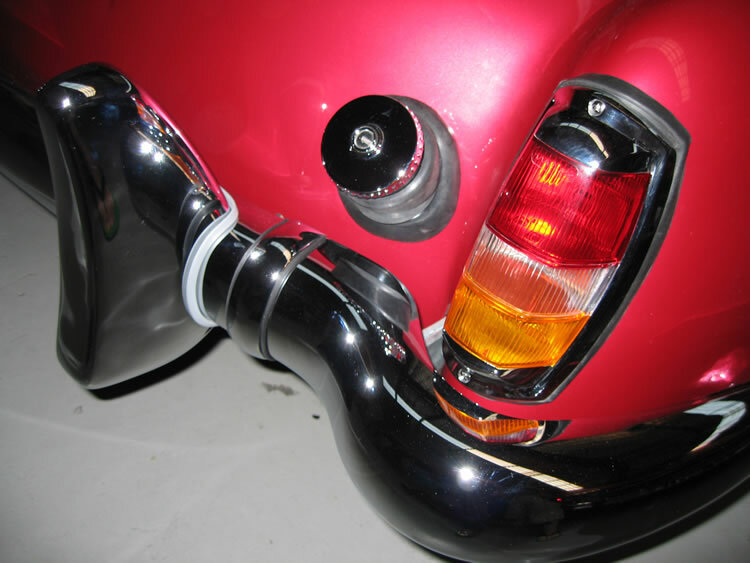 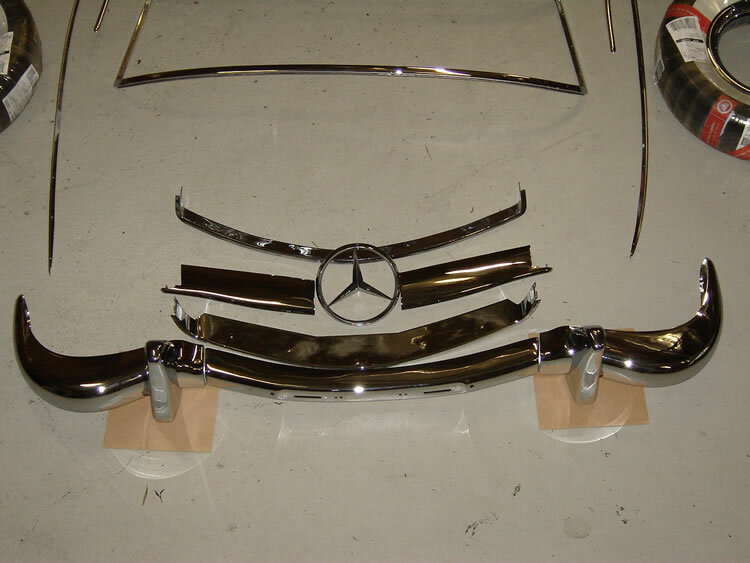 Over the years due to neglect and poor maintenance the chrome was very sad looking indeed and has been painstakingly repaired and rechromed using the best people in the business as the entailing photos will show. 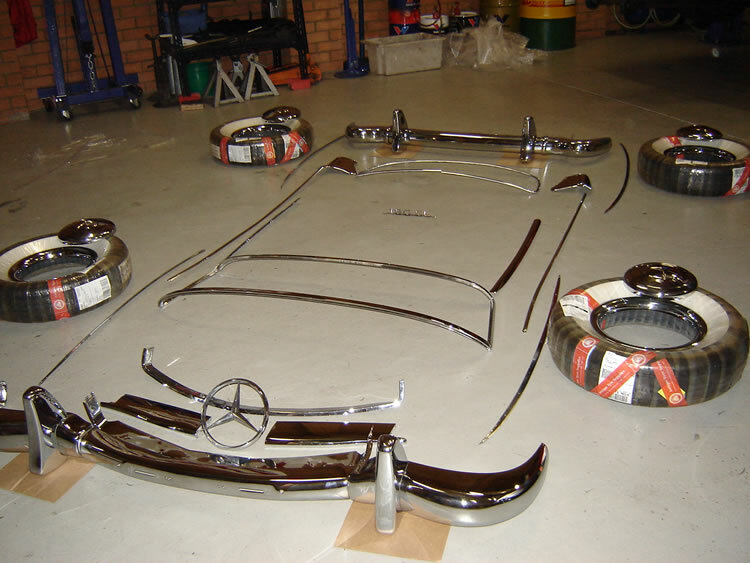 Also the surrounding aluminium trims also got lavish amounts of attention and truly look fantastic sitting in their bags waiting to grace the roadster. 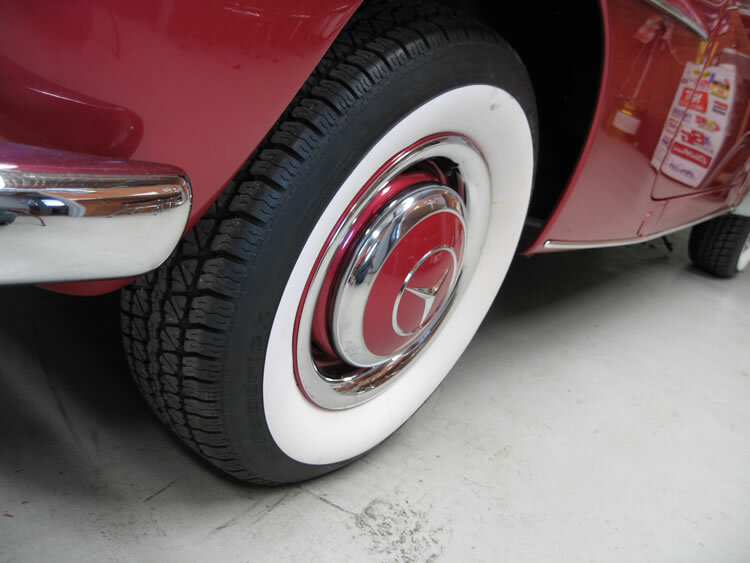 Its feet will also be firmly hugging the tarmac with its factory appearing Silvertown radials in place of what would be a OEM cross-ply. 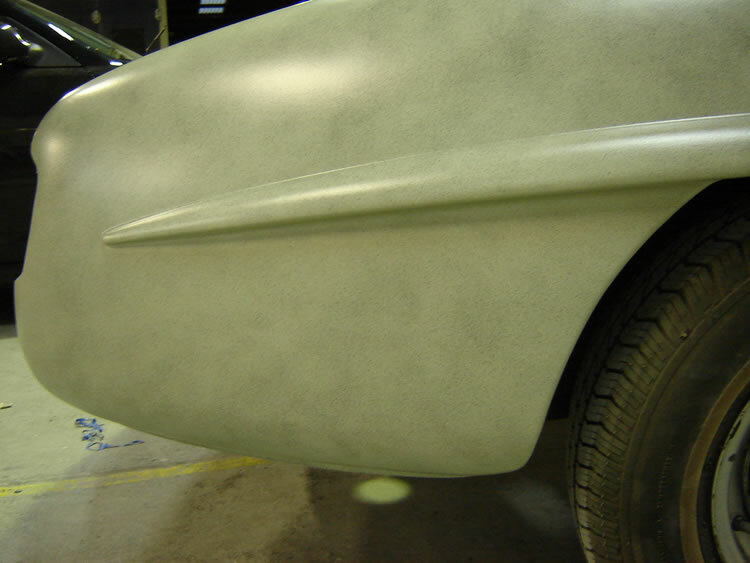 This will definitely be a spectacular looking car when completed and when you take into account its splendid looking colour combination which we believe is one of the finest in this series. 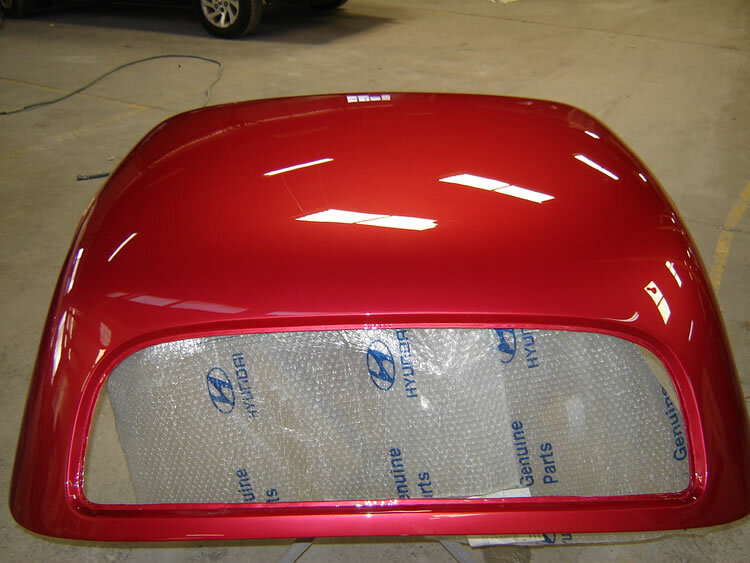 Strawberry red will really complement the luscious tan leather interior. Finally when winter sets in, the roadster has its optional canopy to keep the occupants warm and dry. 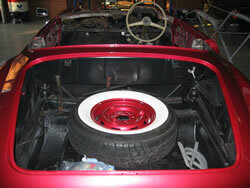 Today, we started the roadster with a burst of enthusiasm. 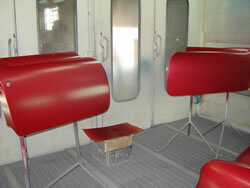 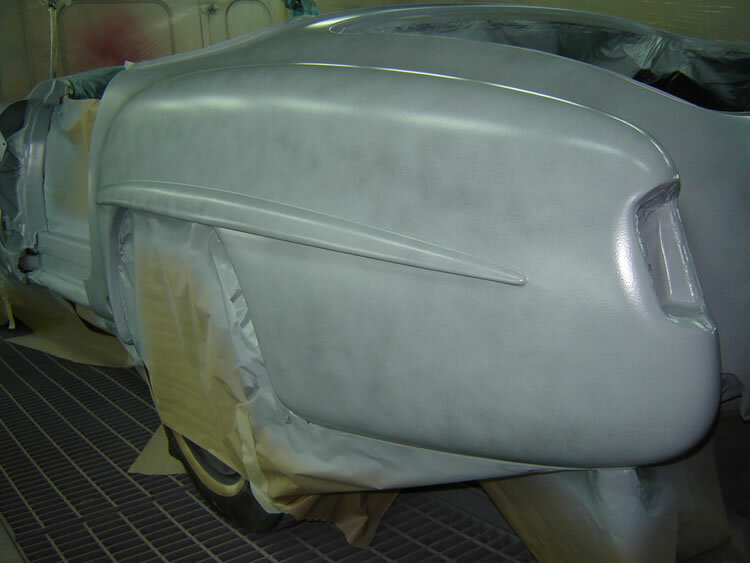 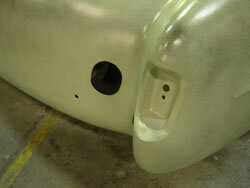 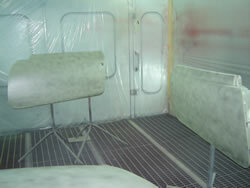 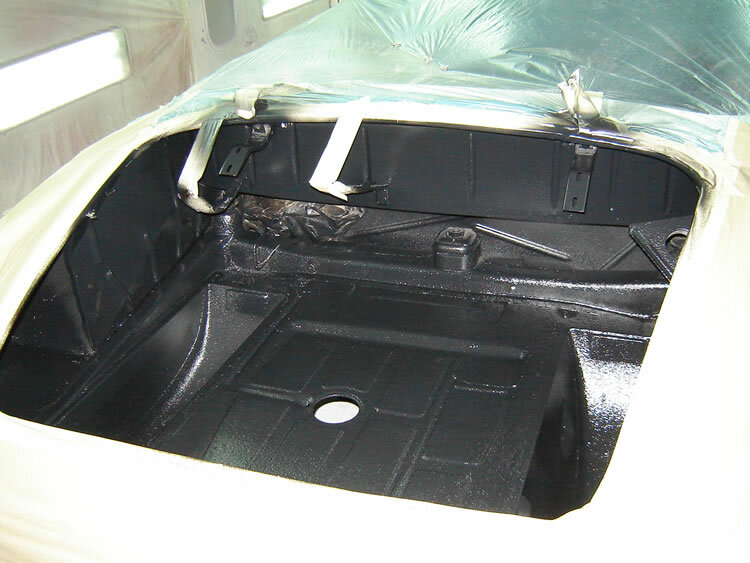 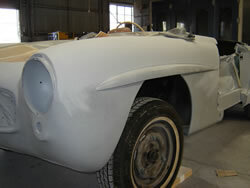 Last week the epoxy primer had been meticulously sanded in preparation for the final coats of finishing primer. 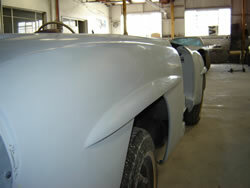 These layers are required to fill the heavy scratching the blocking had made to the coupe’s curves. Four coats were liberally applied, but most of this will be sanded away leaving the body looking better than brand new ready for its new Strawberry Red basecoat. 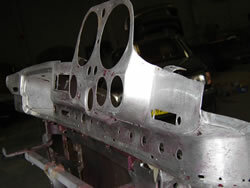 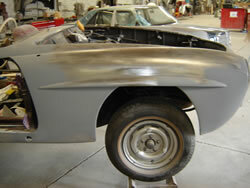 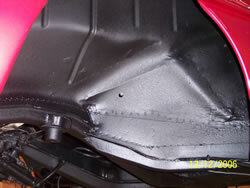 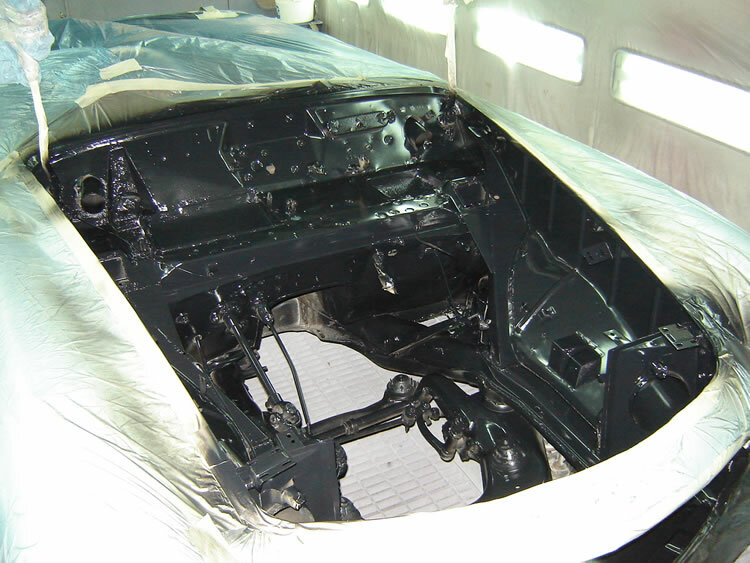 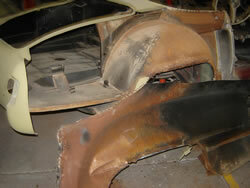 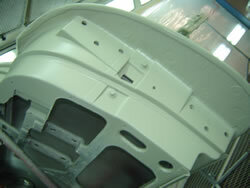 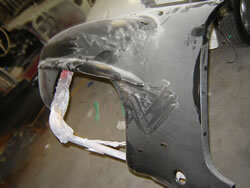 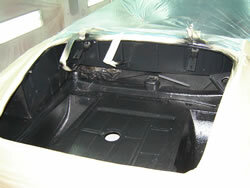 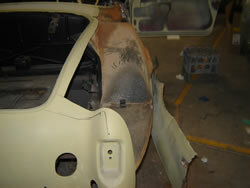 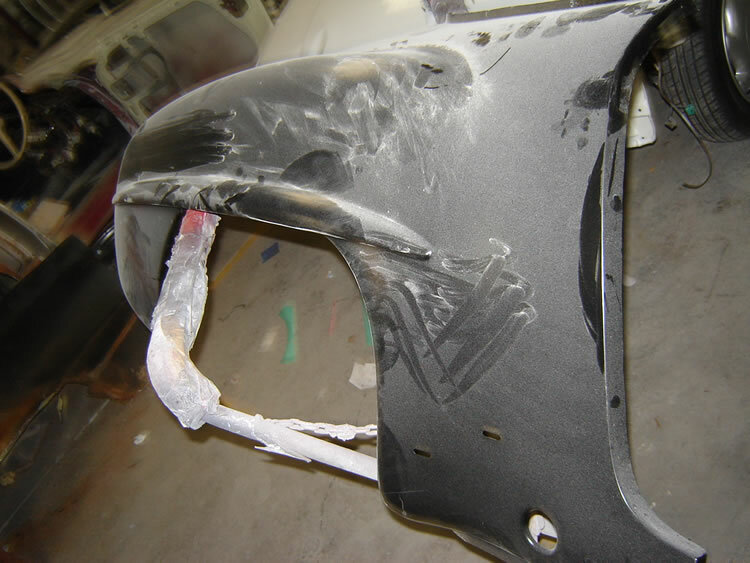 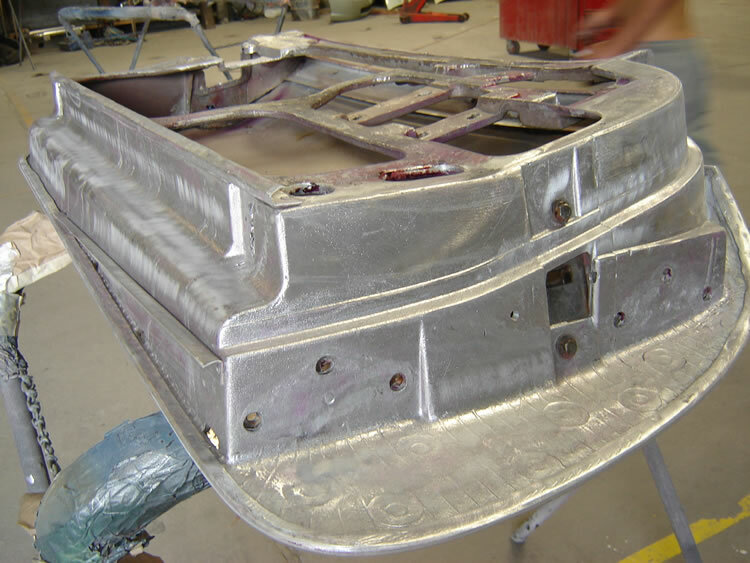 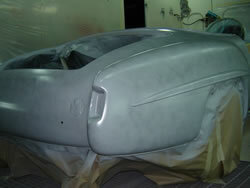 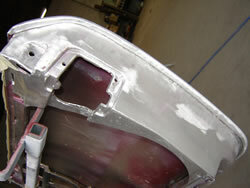 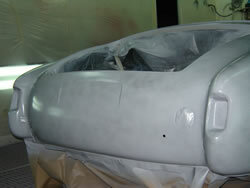 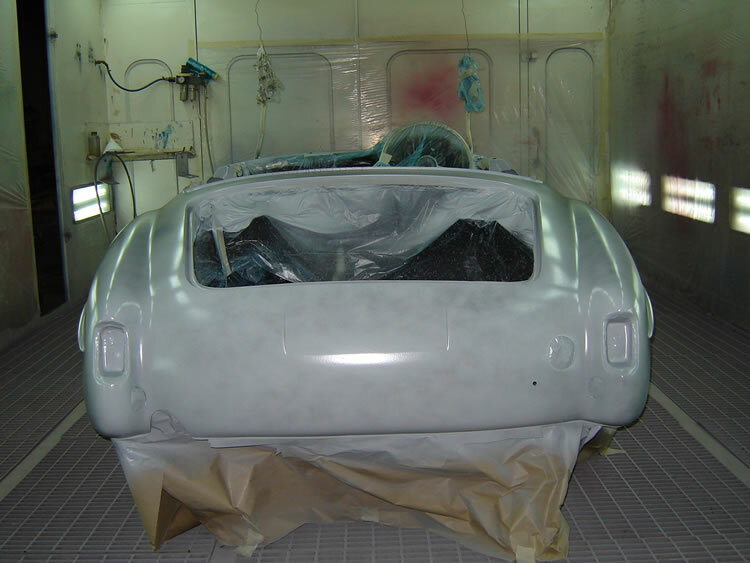 Some areas were spot-primed so no bare metal remained exposed. We wore all our fingerprints off our hands today, as the coupe copped no less than 3 different grades of wet rubbing. The coupe will enter the spray booth this coming Friday minus its wheels, and set up high on jackstands ready for its new suit come Saturday. 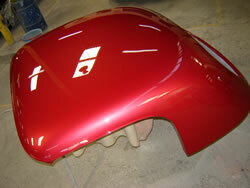 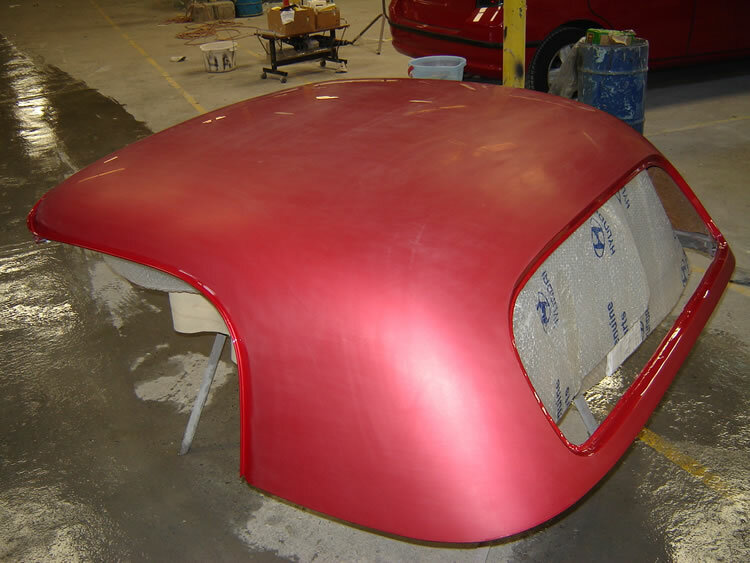 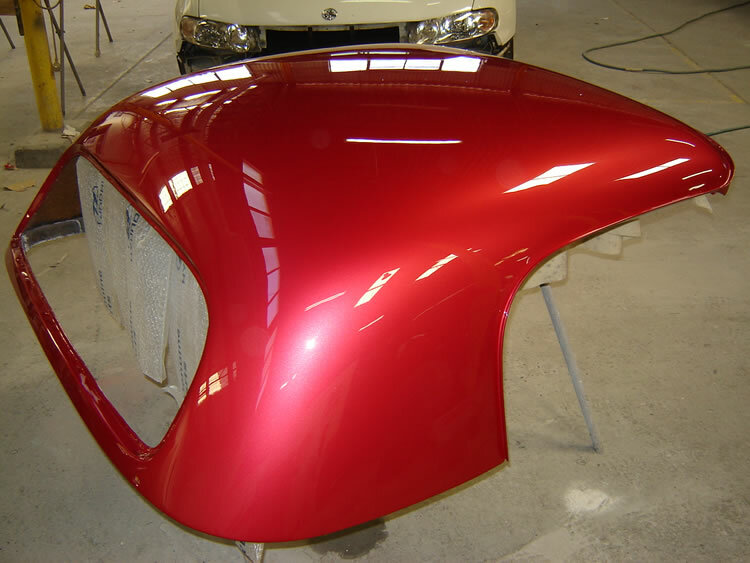 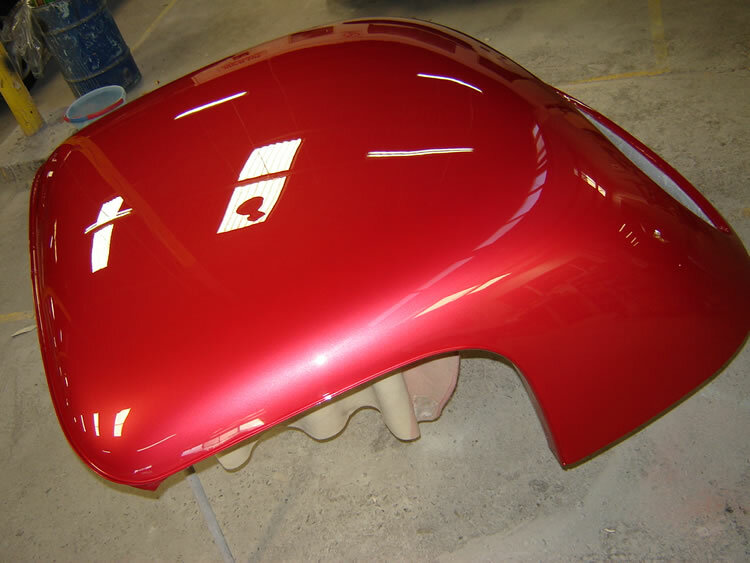 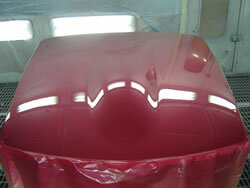 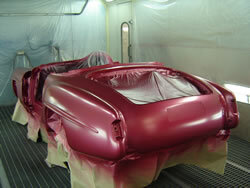 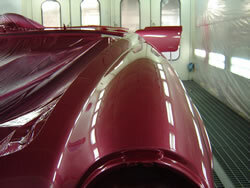 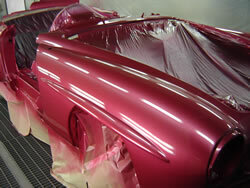 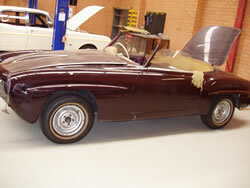 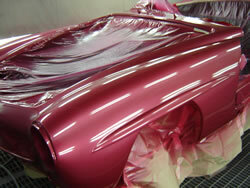 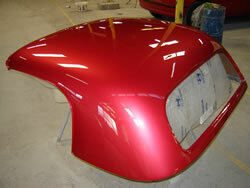 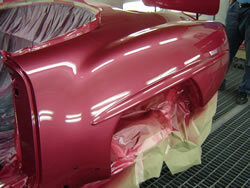 The hardtop roof was also painted recently, giving me an indication of how visually striking the colour really is. 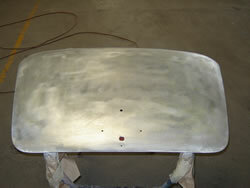 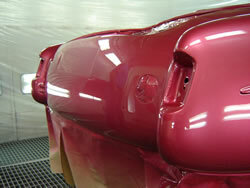 It was cut back with 1200, followed by ultra-fine 1500,and finally 2000 grade paper and buffed to a mirror like finish. 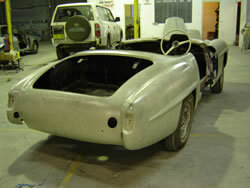 It is now off to the trimmers for its new headlining and rear window and stainless finishing trims. 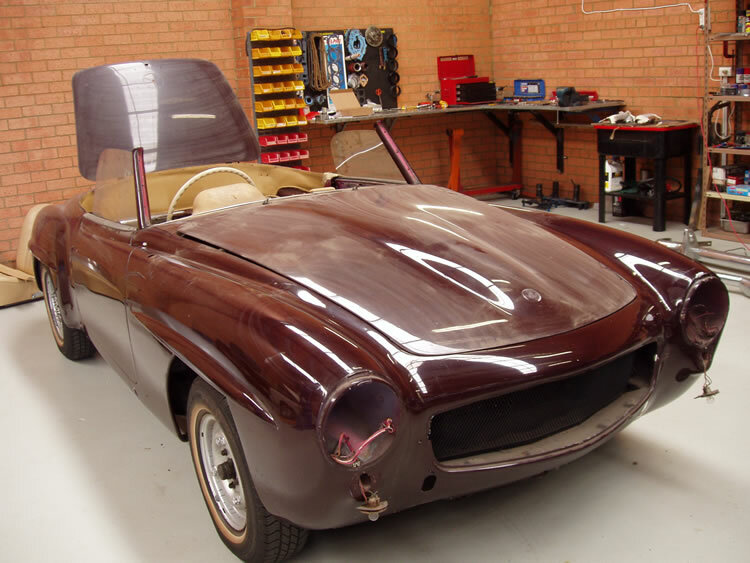 We are almost there with the completion of this awesome looking little machine, so stay tuned as the project progresses to the final paint stages. 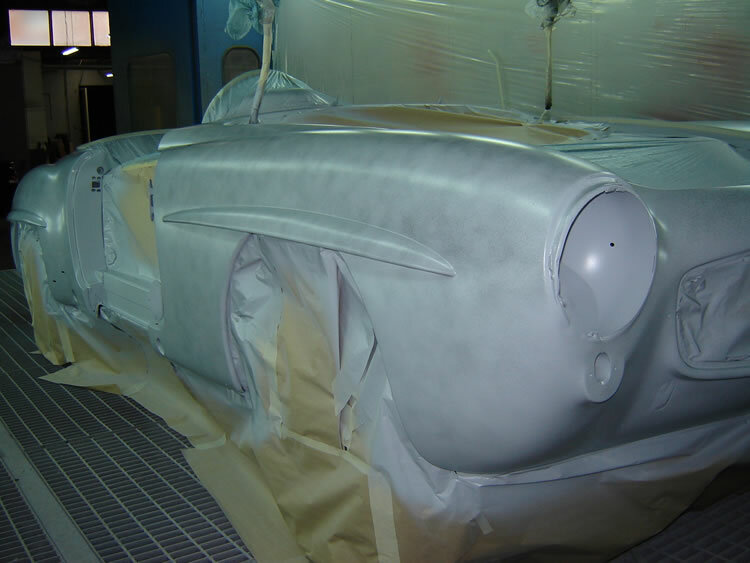 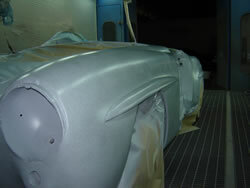 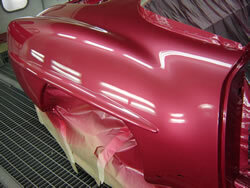 I arrived nice and early to prepare the Mercedes for its final coats of colour. After some thorough masking and de-greasing of panels, I set to work applying the multiple layers of strawberry red basecoat. 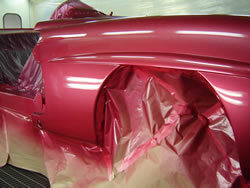 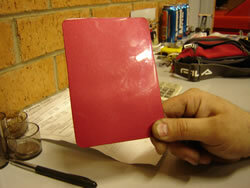 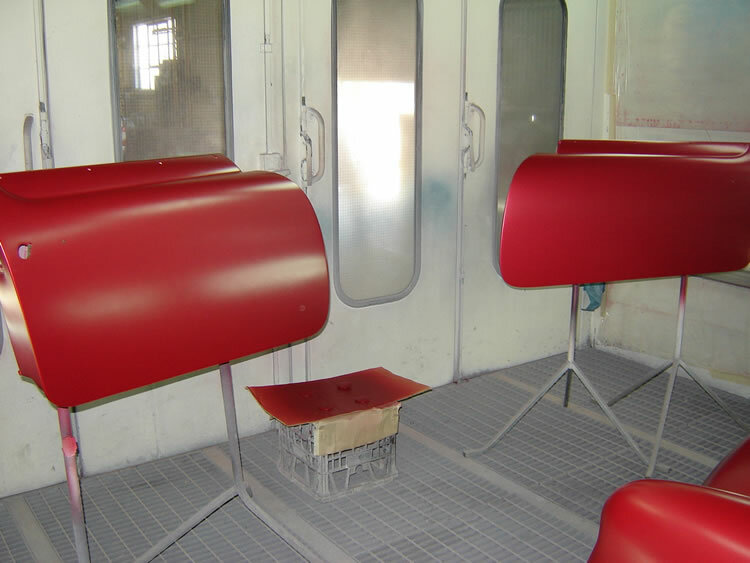 Due to the poor hiding power of this particular colour, four coats were required instead of the usual two. 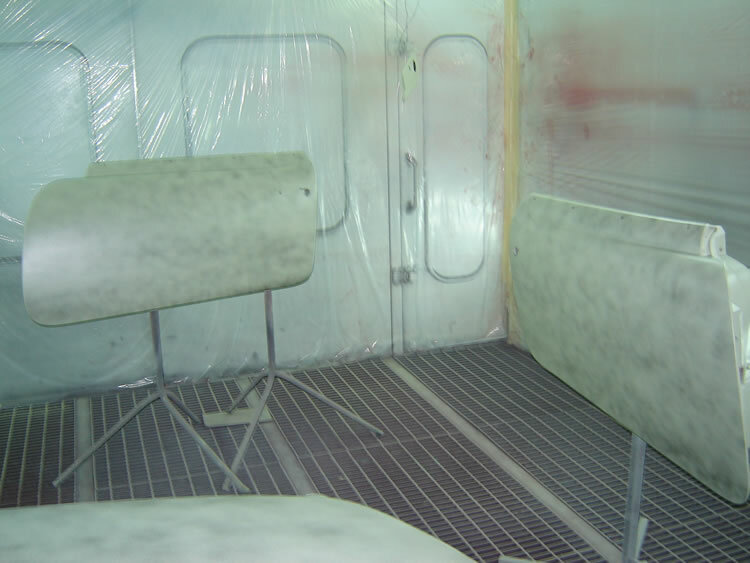 After what seemed like forever, I finally mixed the 2 pack clear and left it in the booth to reach its required working temperature. 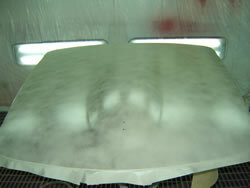 This makes the clear behave like water and makes it easier to spray on smoothly, eliminating dry spray and dull layers. 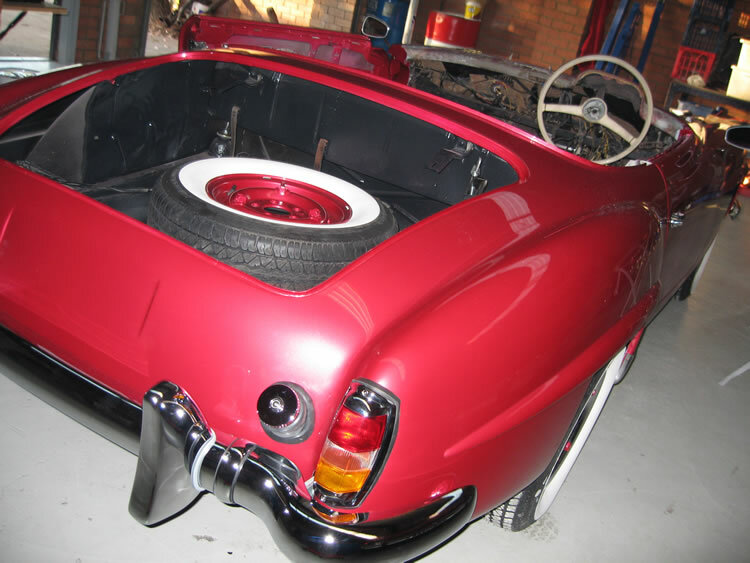 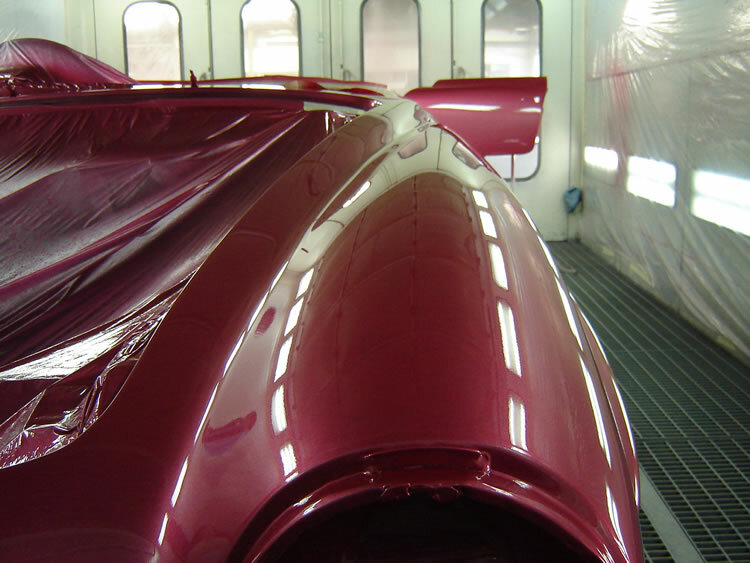 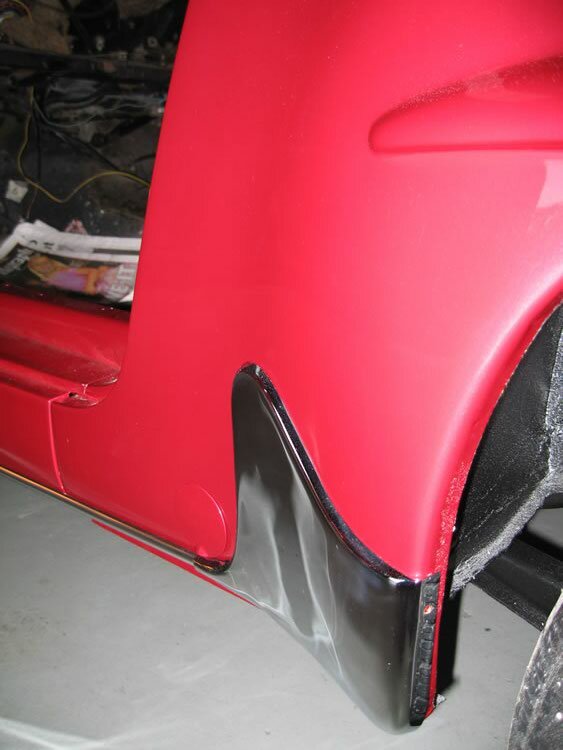 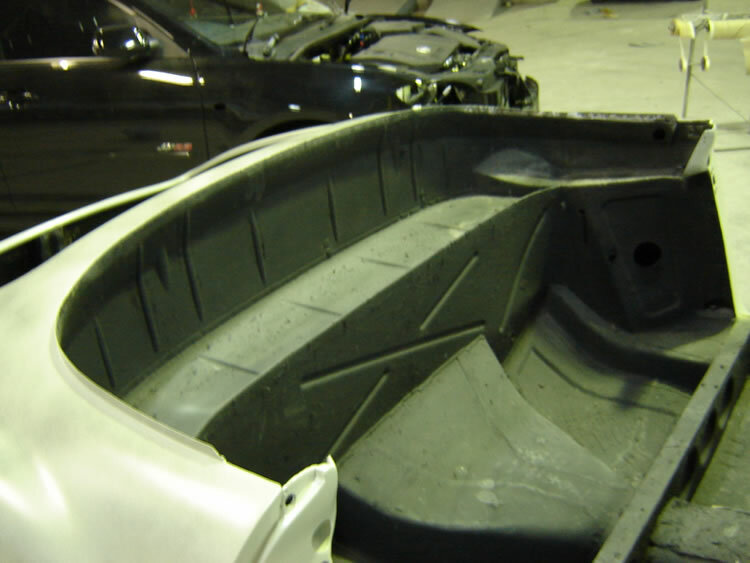 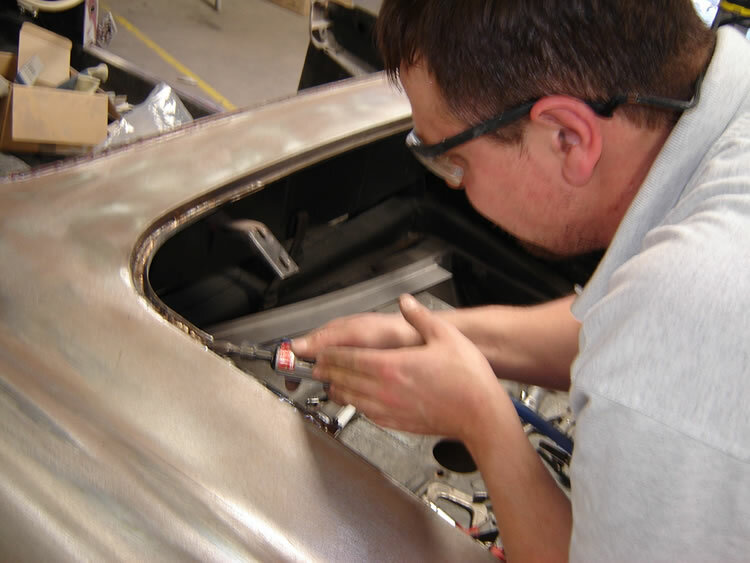 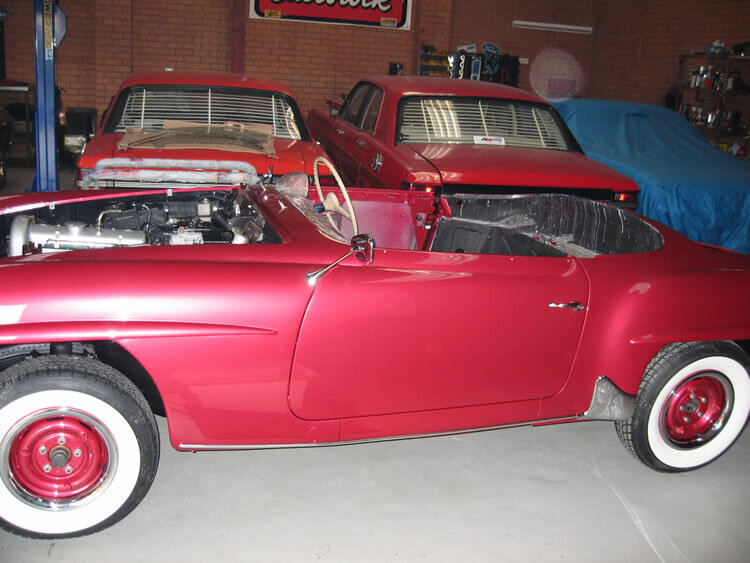 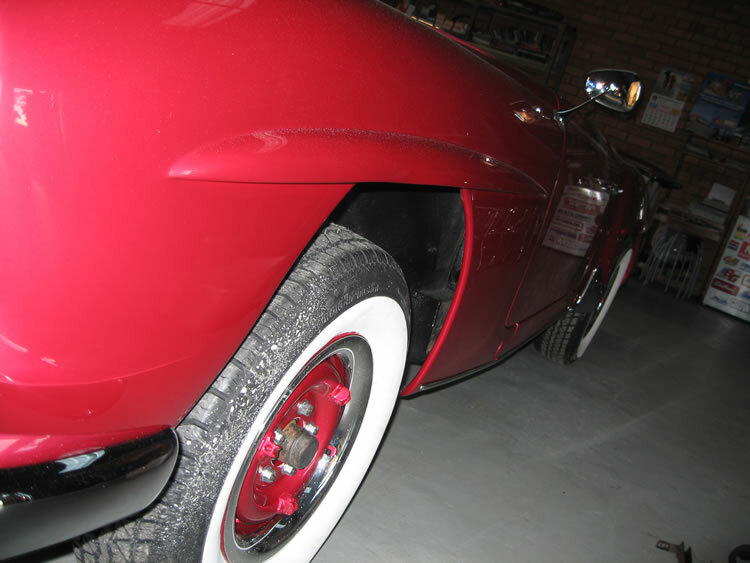 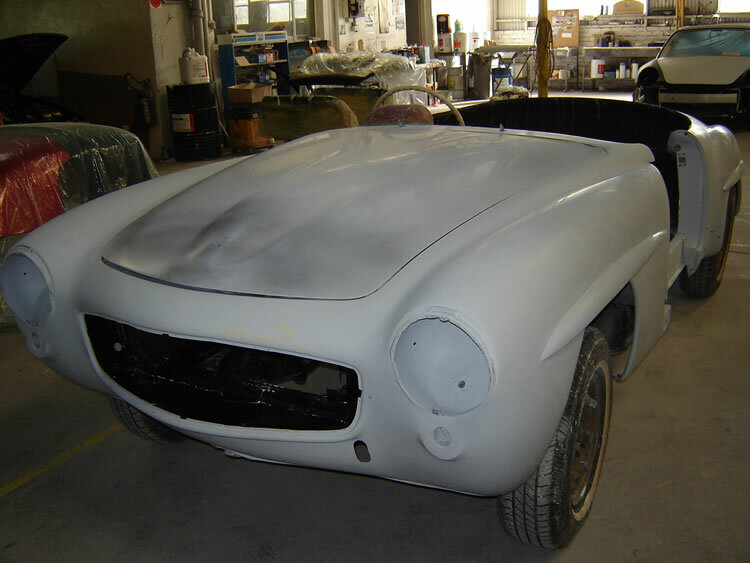 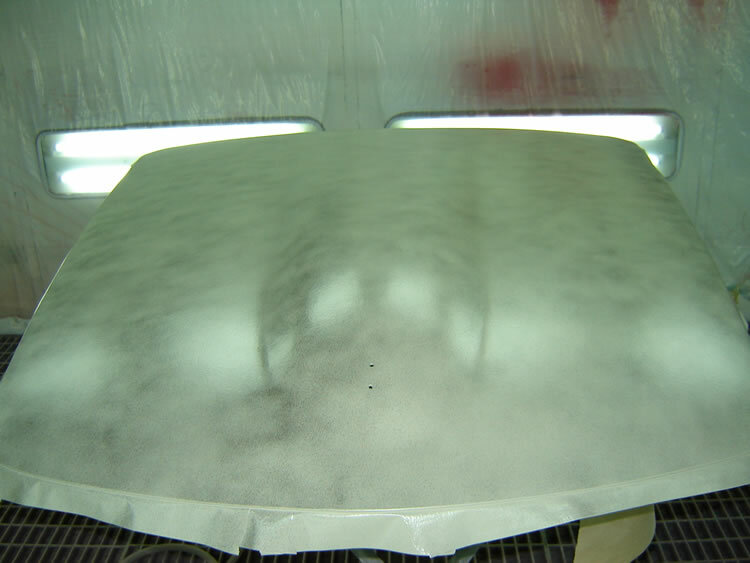 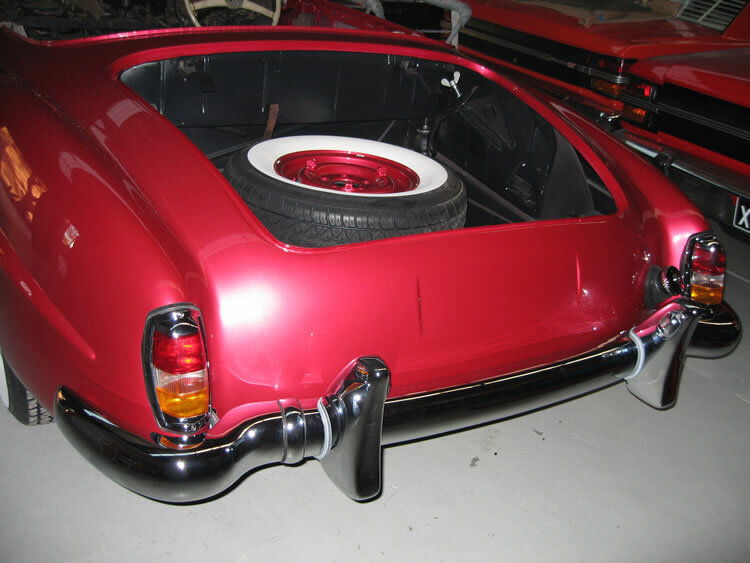 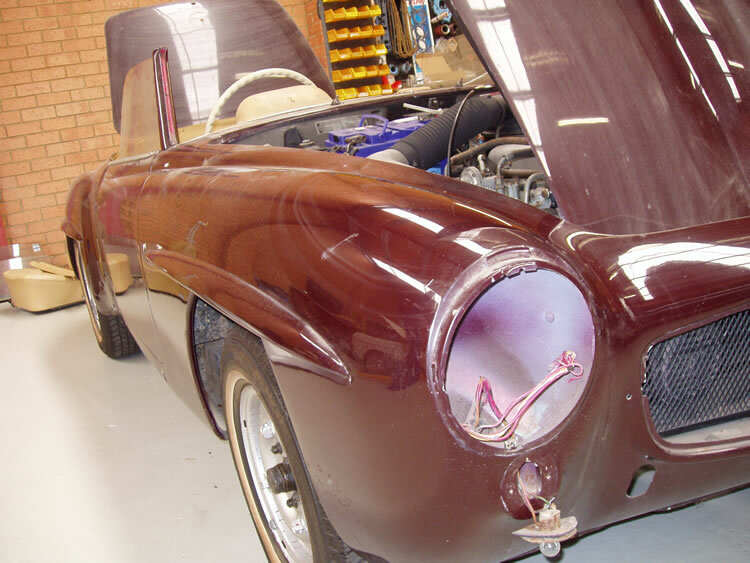 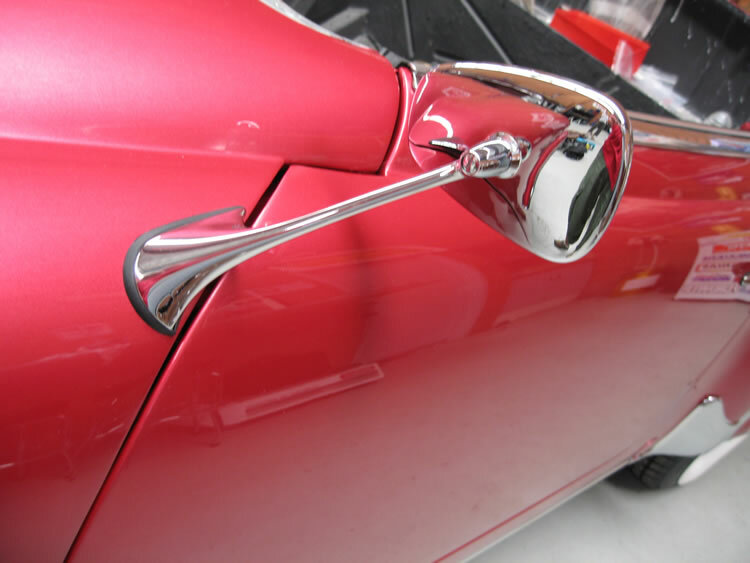 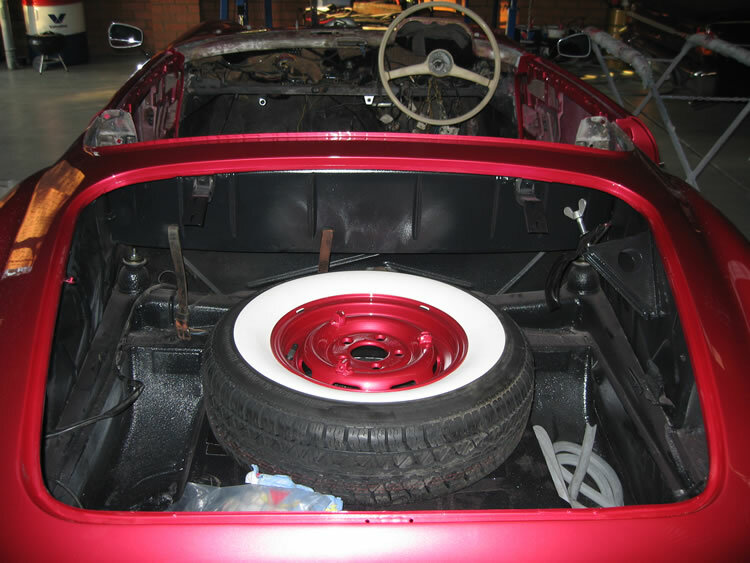 These photos show the true style this roadster has in the body department, and It will receive a final cut and polish to remove any small surface imperfections. 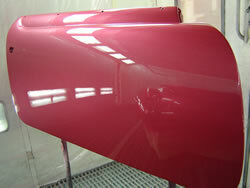 The true gloss will then be revealed. 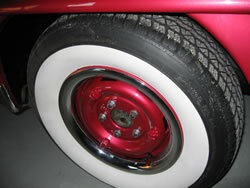 My final pieces left are the brand new hubcaps and the wheels themselves that need a lick of strawberry red. 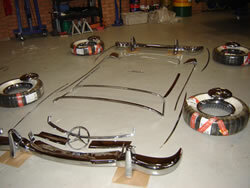 After these are finished, the polishing procedures shall commence. We’ll keep you posted of the final assembly too, so stick around as the action has just begun. 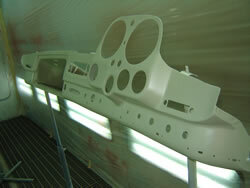 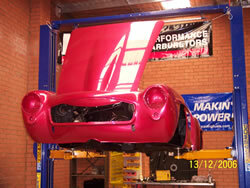 After the fantastic paint job by Nick and Adam at AN Custom Body works the tedious process of assembly begins. 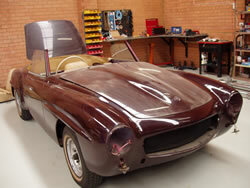 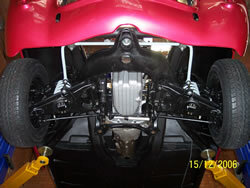 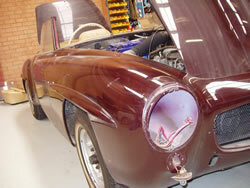 All the parts that have been refurbished over the past 12 months are now ready to grace the little roadster. 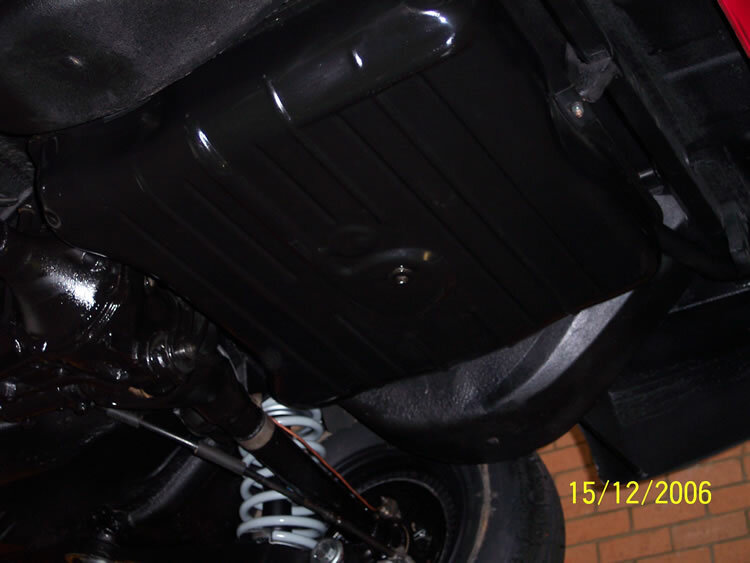 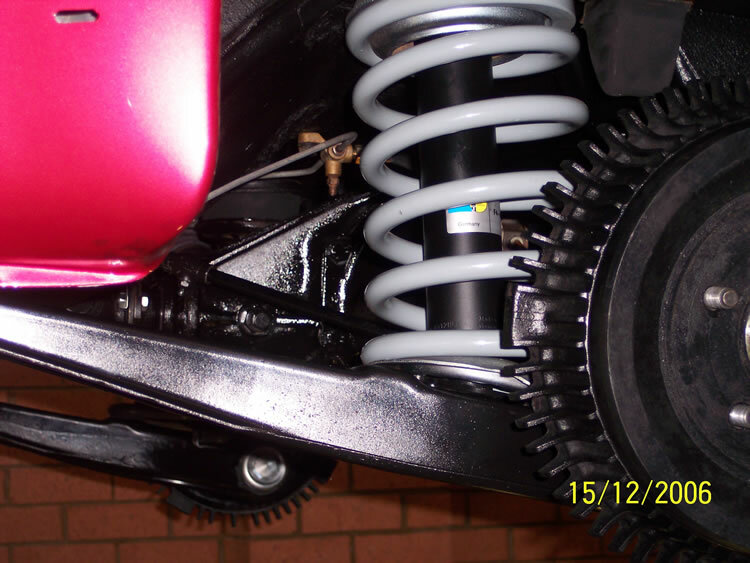 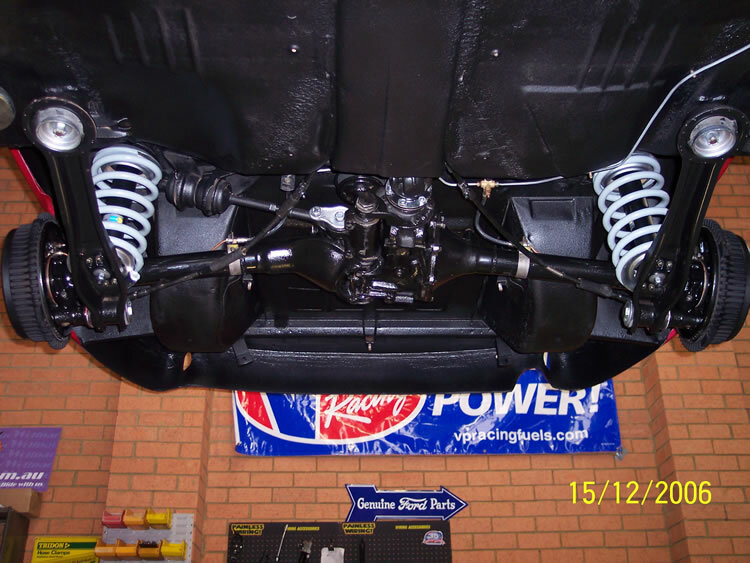 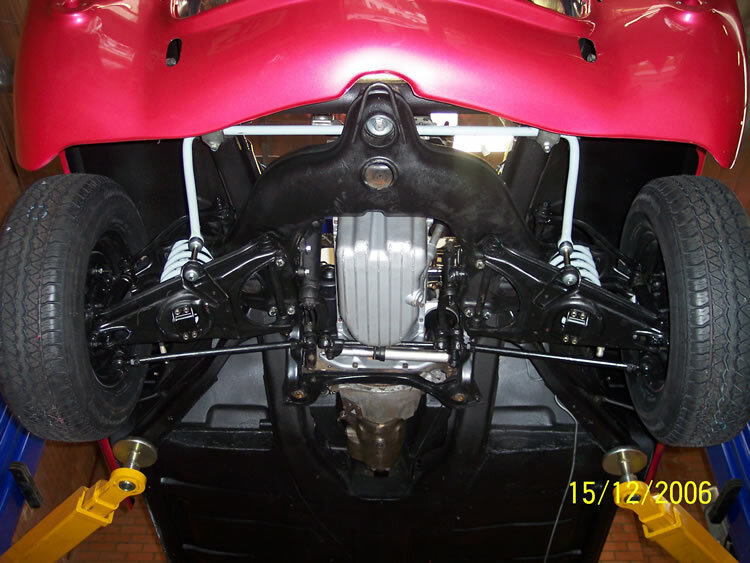 The under carriage was meticulously detailed with under body coatings and all new suspension components such as shocks, springs, rubbers etc etc. 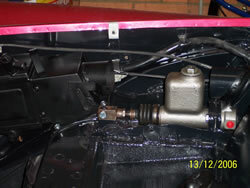 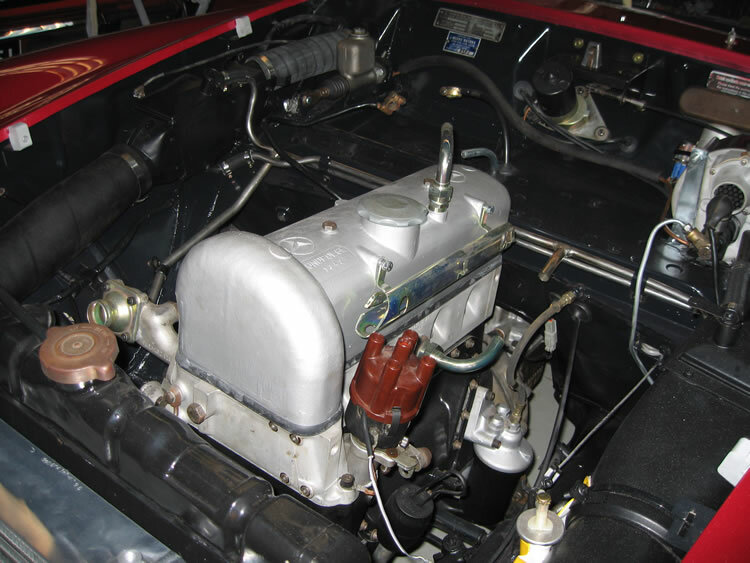 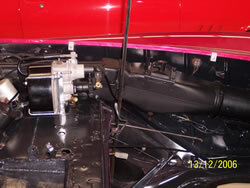 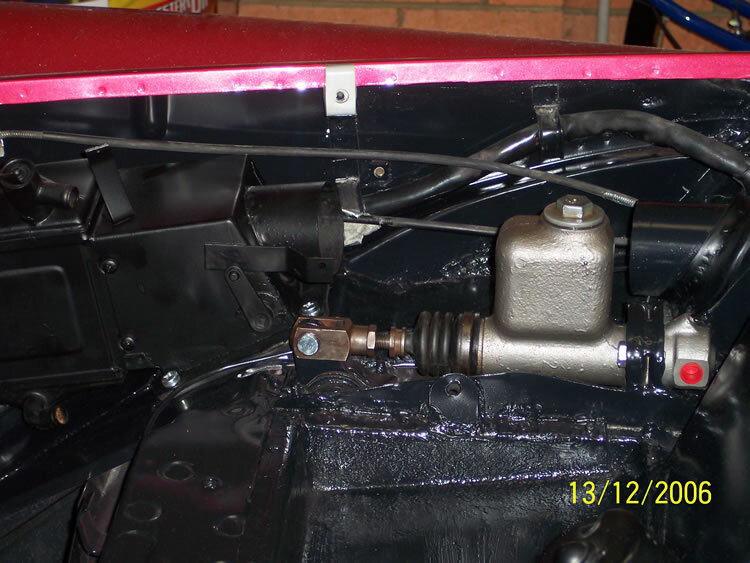 The next phase was to install the engine bay components such as heater controls, wiring, brake booster/master cylinder. 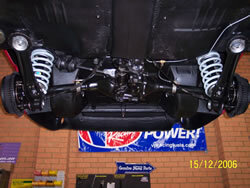 The engine and transmission was then fitted to the sub frame which was installed lowering the car over it as per factory process. 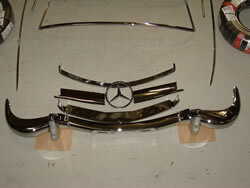 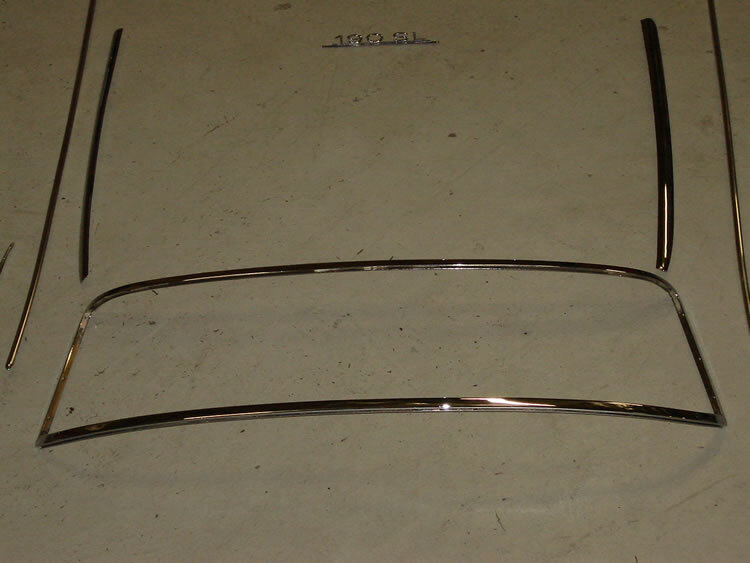 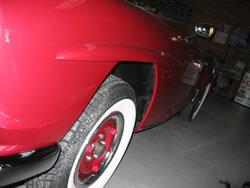 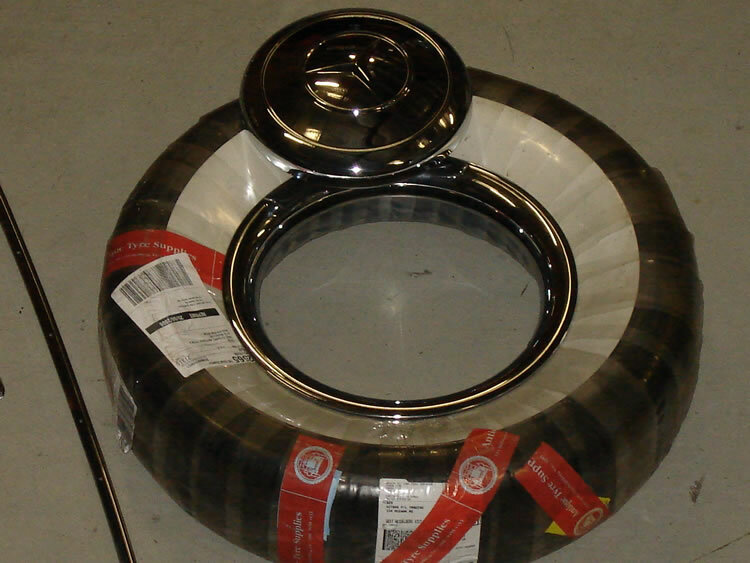 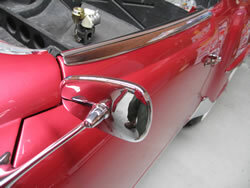 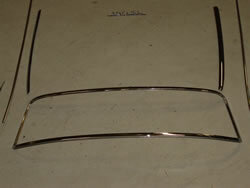 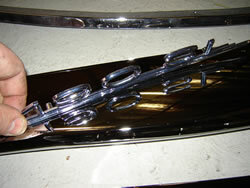 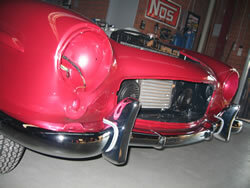 Next was the fitment of all the chrome bits such as badges, trims, moulds, bumpers and overriders. 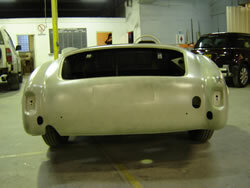 The car is now at this point and now we will be concentrating on wiring up the EFI computer. 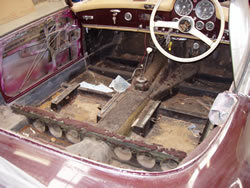 Once this has been completed we will be sending this off to the trimmers who will ensure all wiring is hidden. More updates will follow so stay tuned. 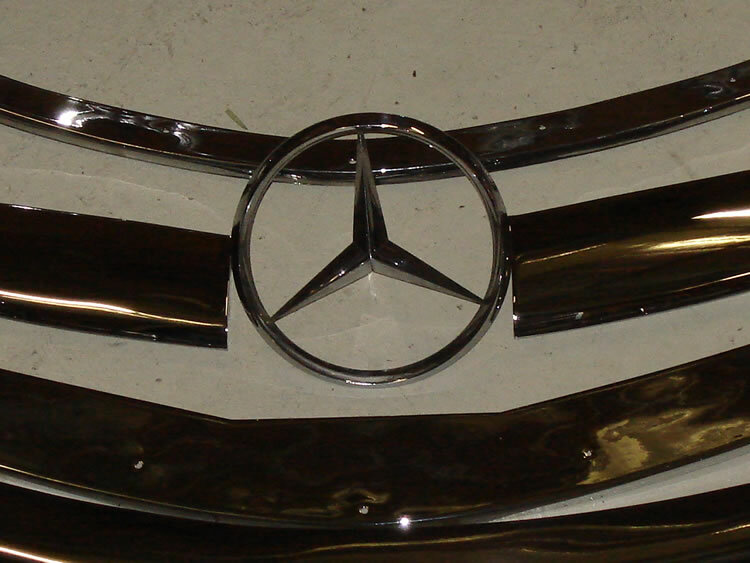 Progress on the little Merc doesn’t stop. 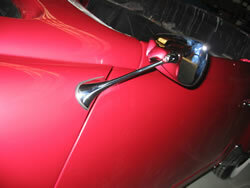 The immaculate chrome pieces have now been fitted. The next phase of this restoration will be to send the car off to the trimmers.